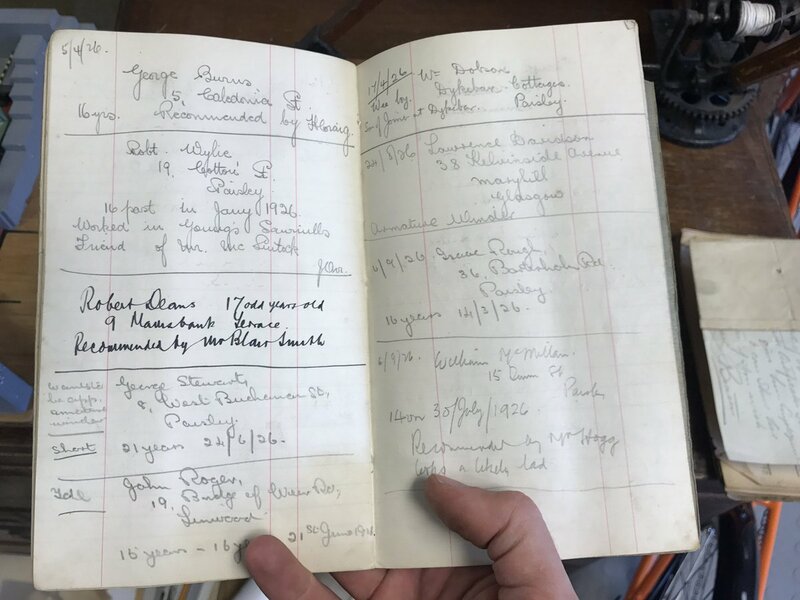 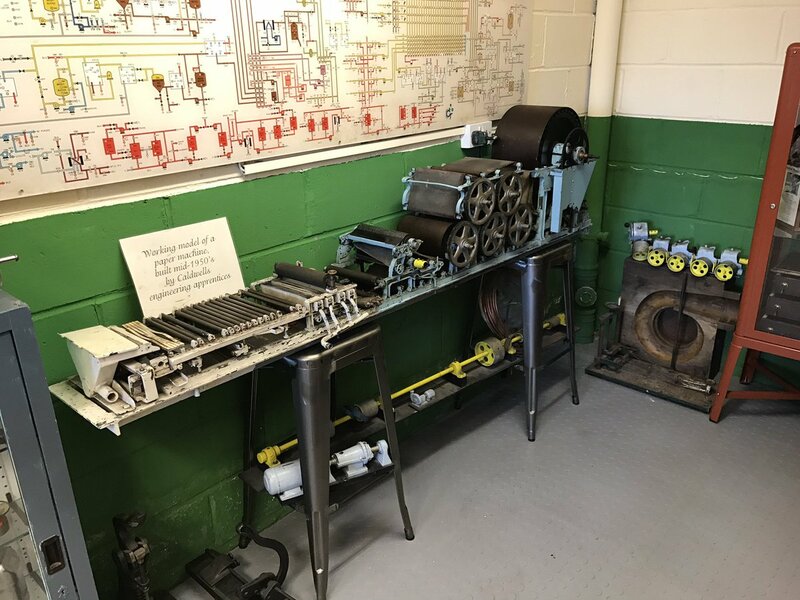 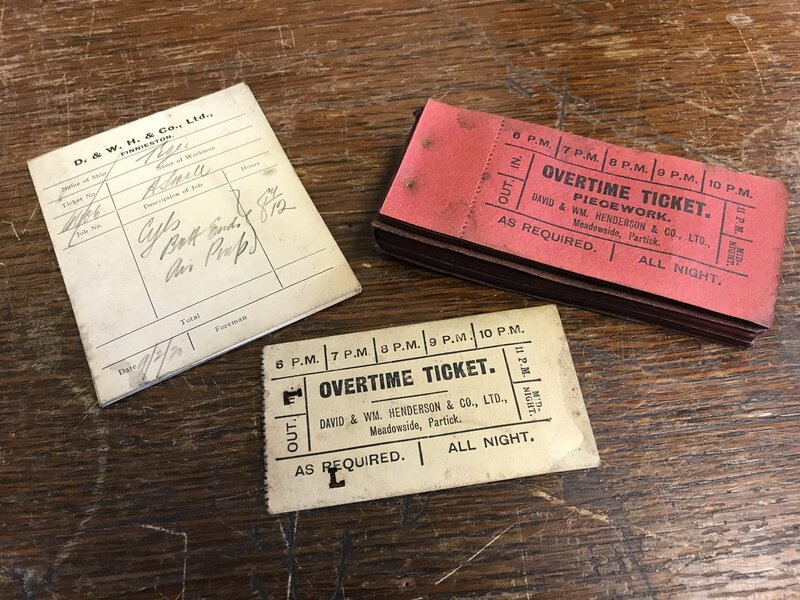 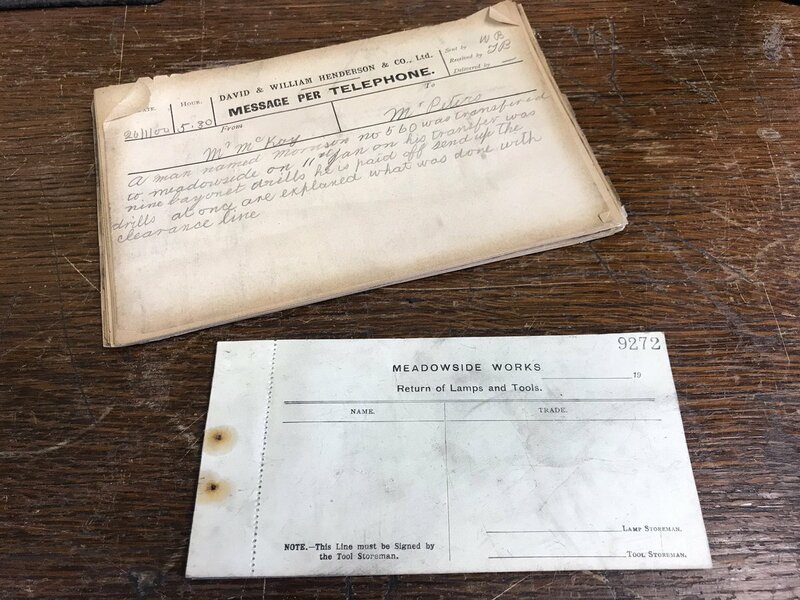 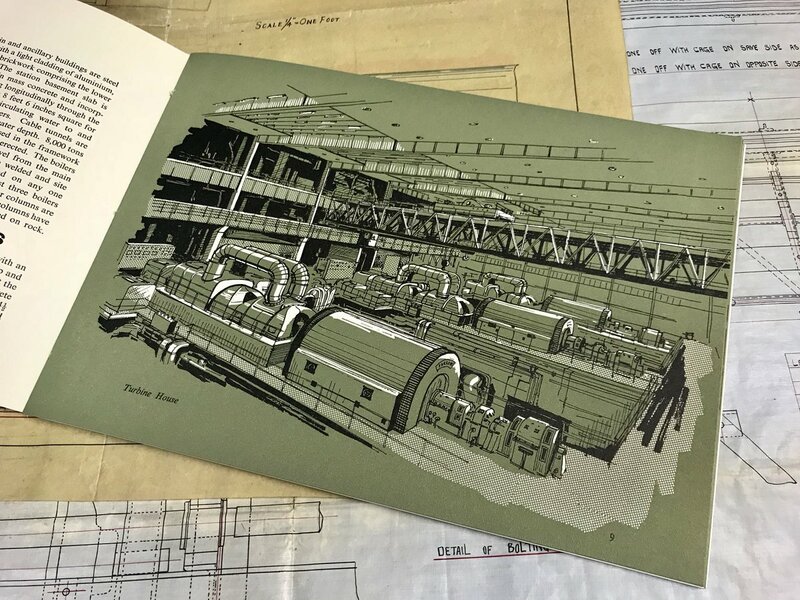 The Kinetics Industrial Museum is a collection of paperwork and artefacts, mostly to do with Glasgow and Scottish industry. 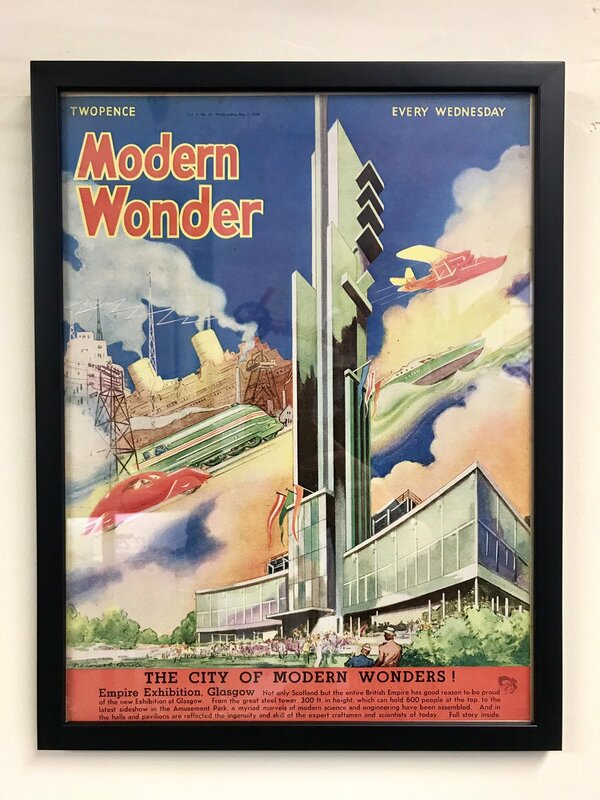 The museum is open during shop hours. 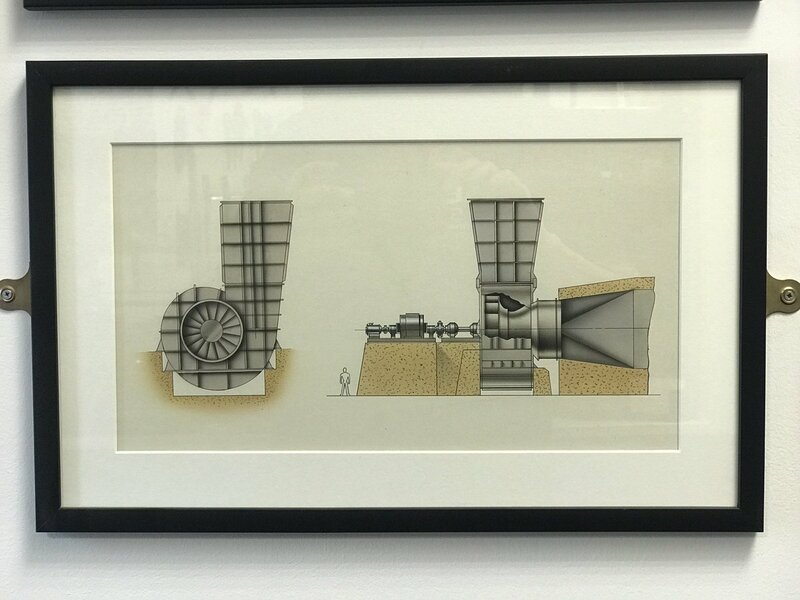 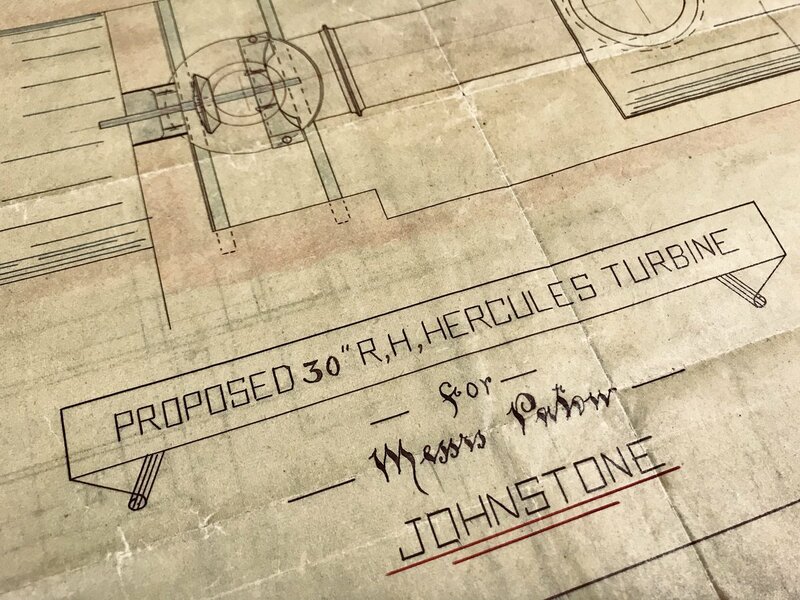 A beautiful drawing of a water turbine for Paton’s Mill, Johnstone. 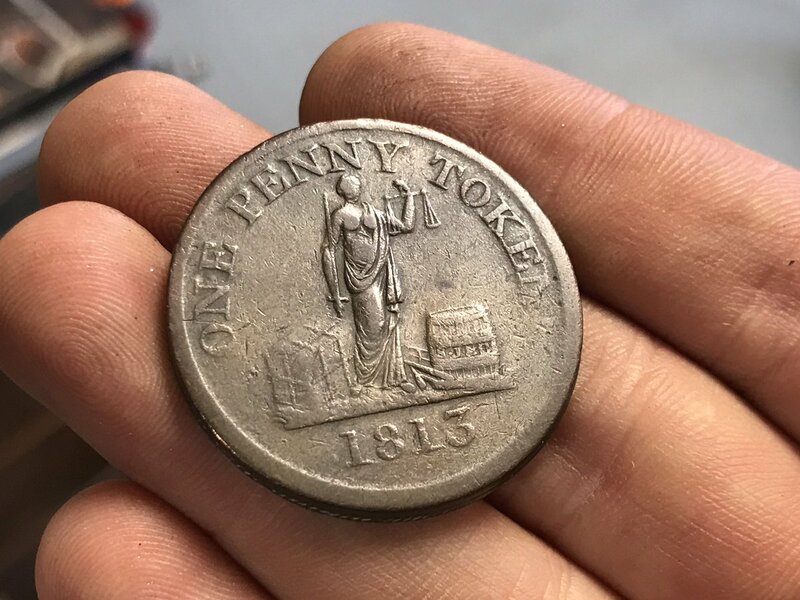 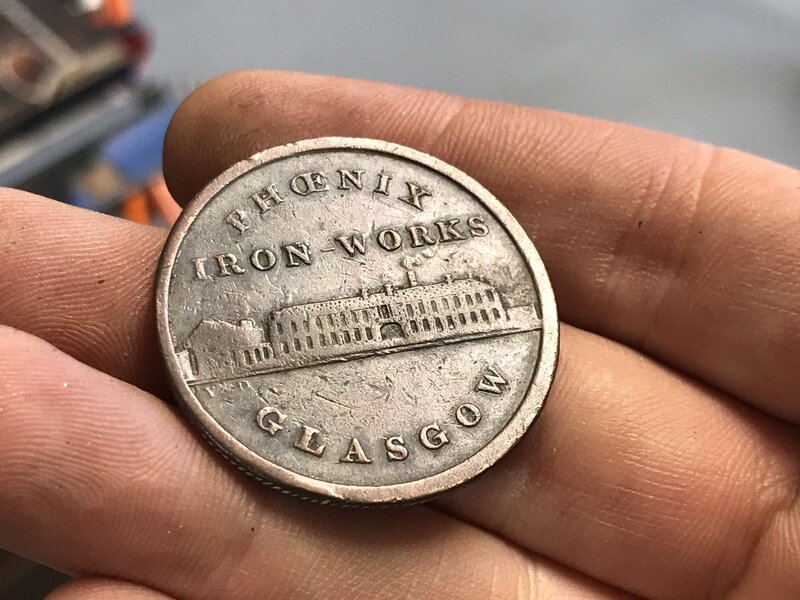 Phoenix Iron Works One Penny token, 1813. 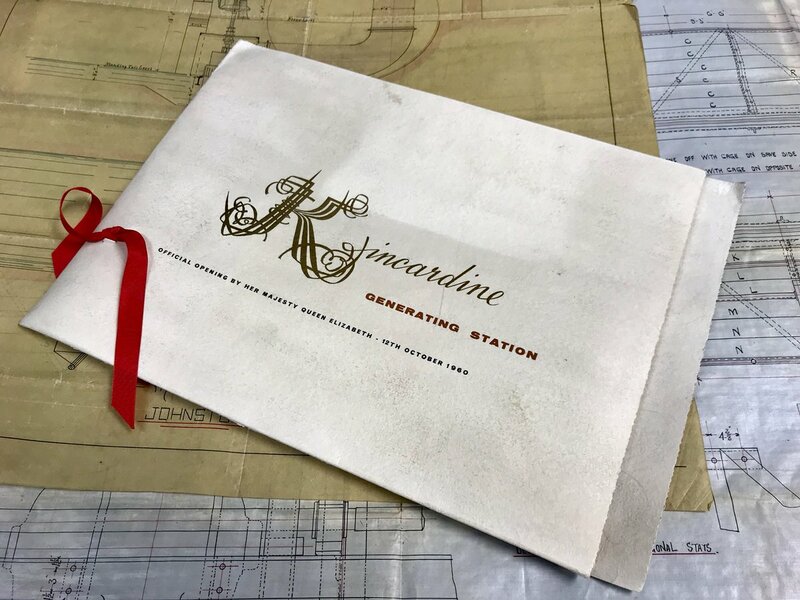 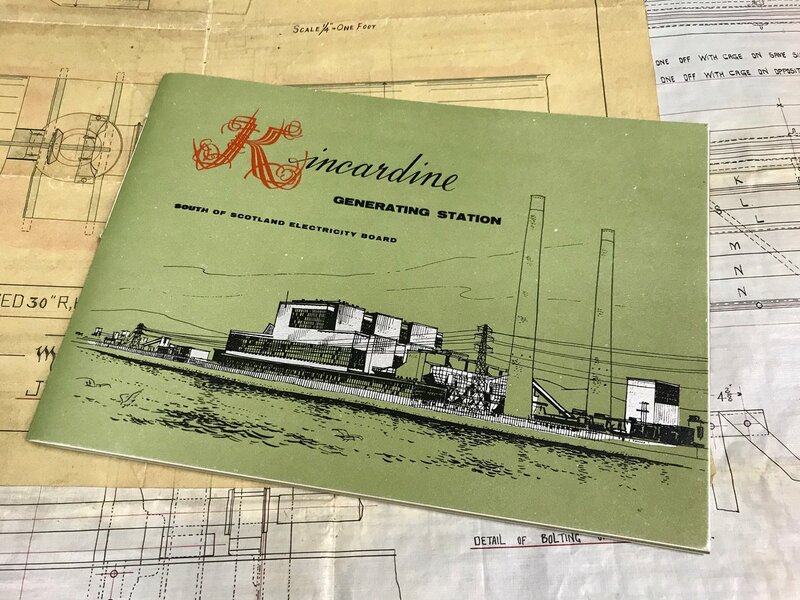 Brochure from the opening of Kincardine Power Station. 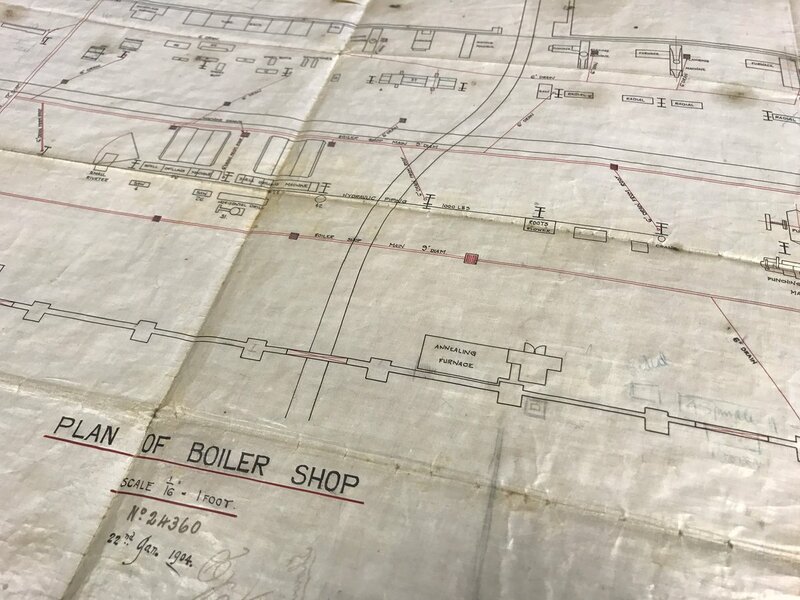 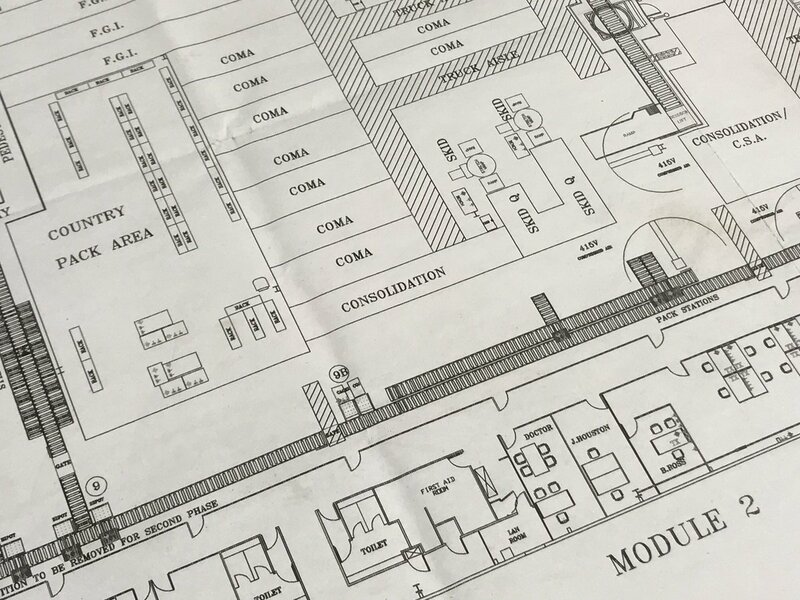 1904 plan of the Boiler Shop at the John Brown yard in Clydebank. 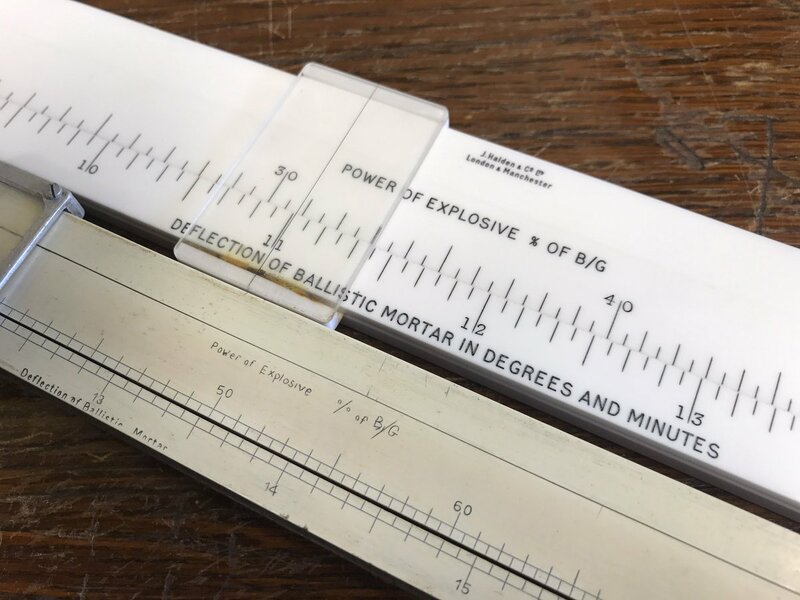 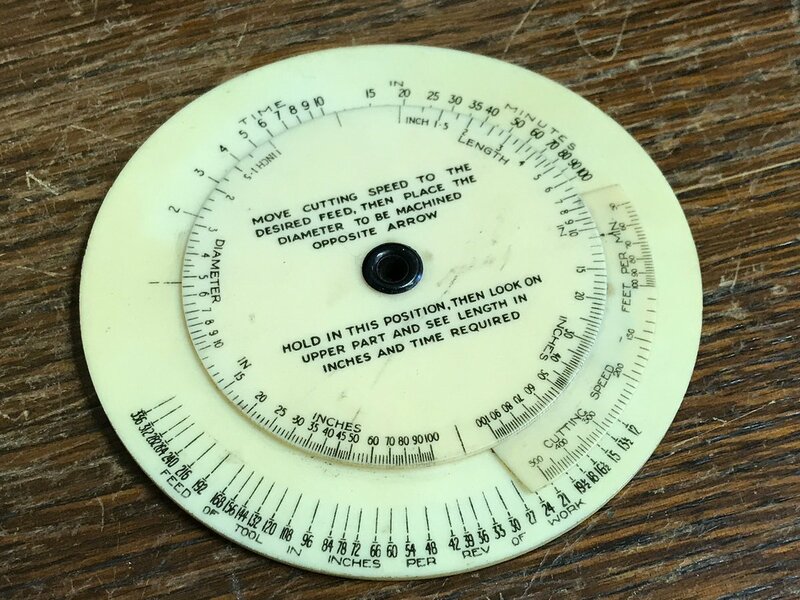 Ballistic mortar slide rules from Nobel’s Explosives. 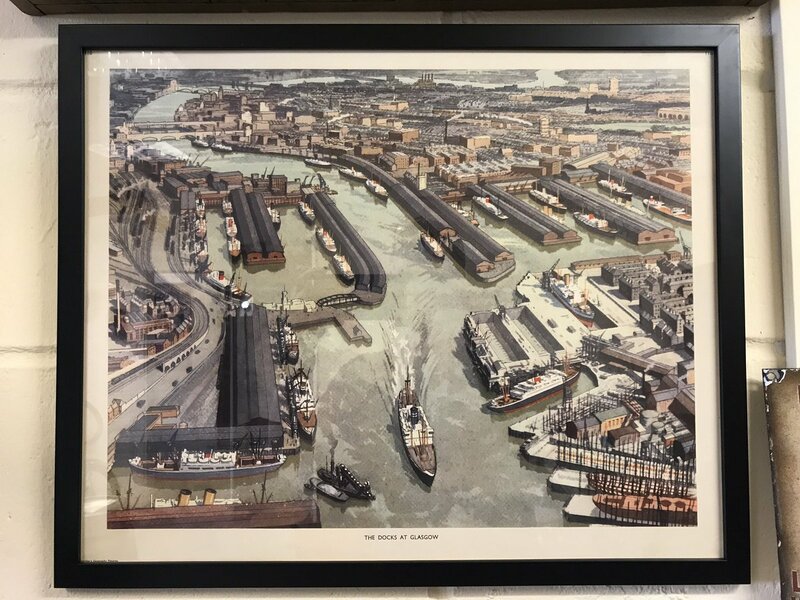 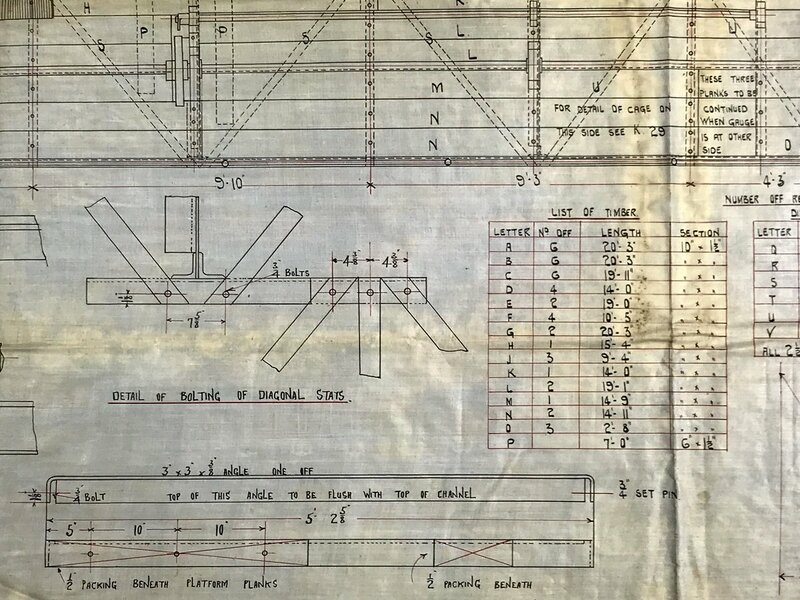 Plan by William Arrol & Co for the John Brown shipyard. 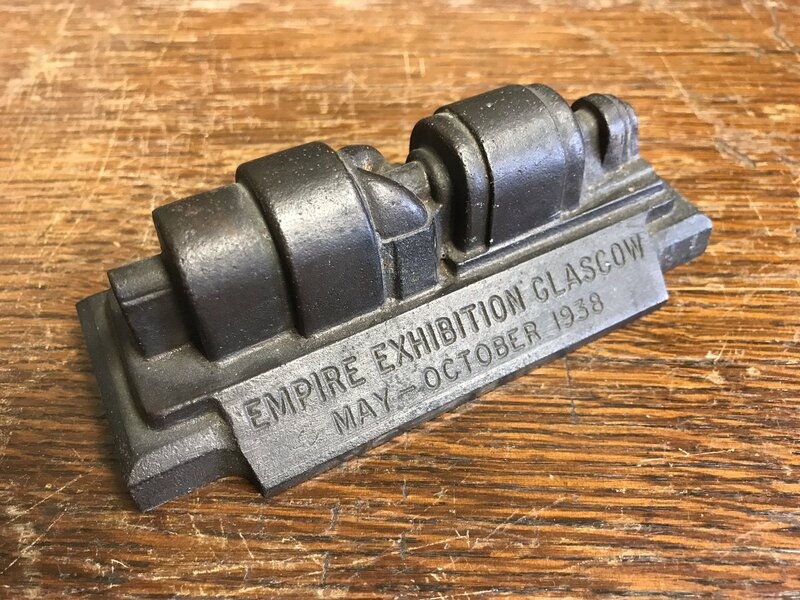 Model Parsons steam turbine from the 1938 Glasgow Empire Exhibition. 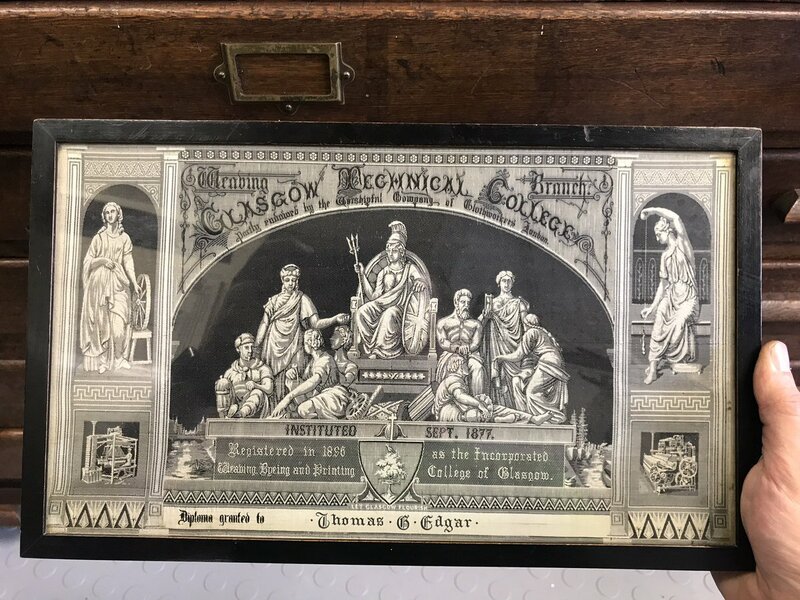 Woven silk diploma from the Glasgow Technical College. 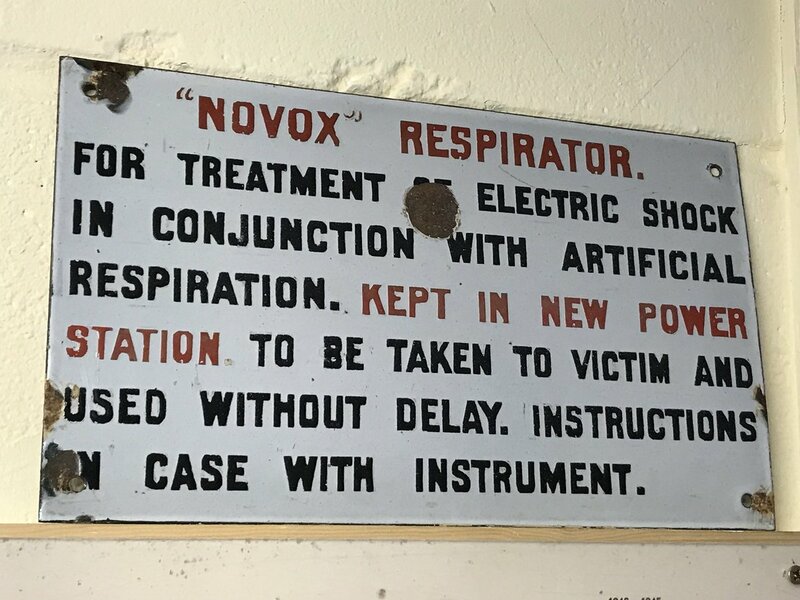 Enamel sign for a Novox respirator, from a paper mill. 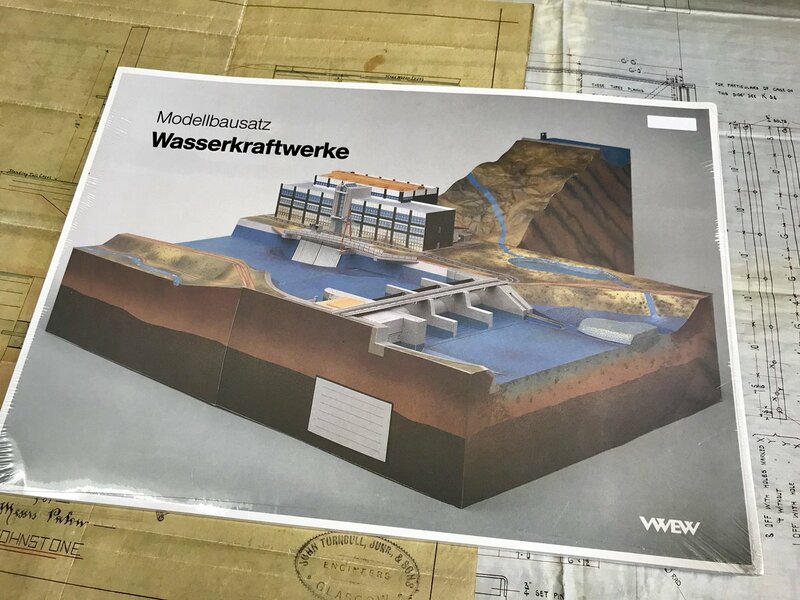 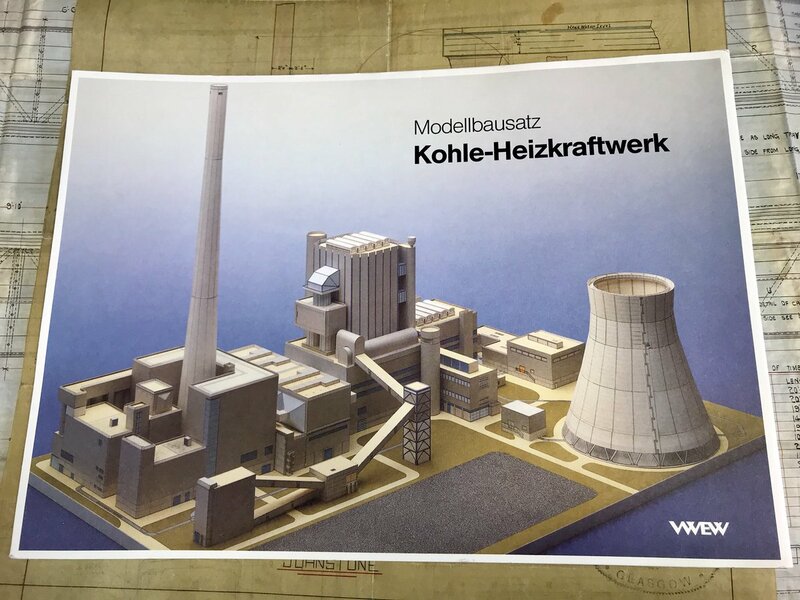 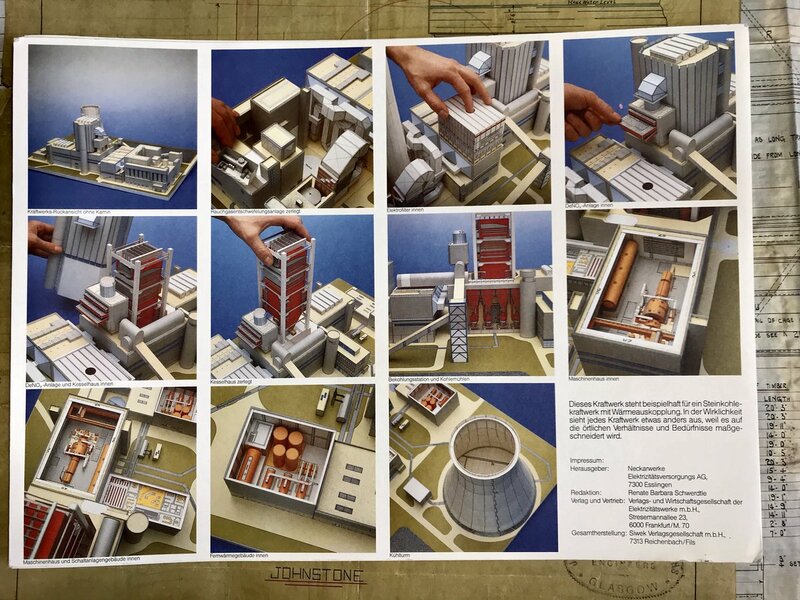 German model coal and hydro power stations. 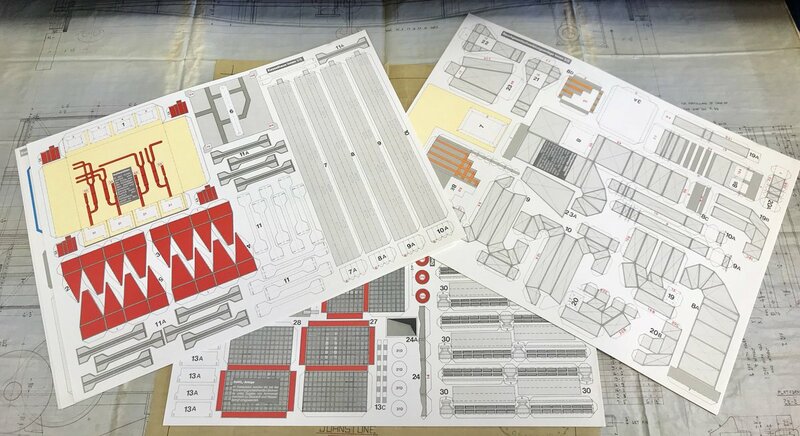 Some assembly needed. 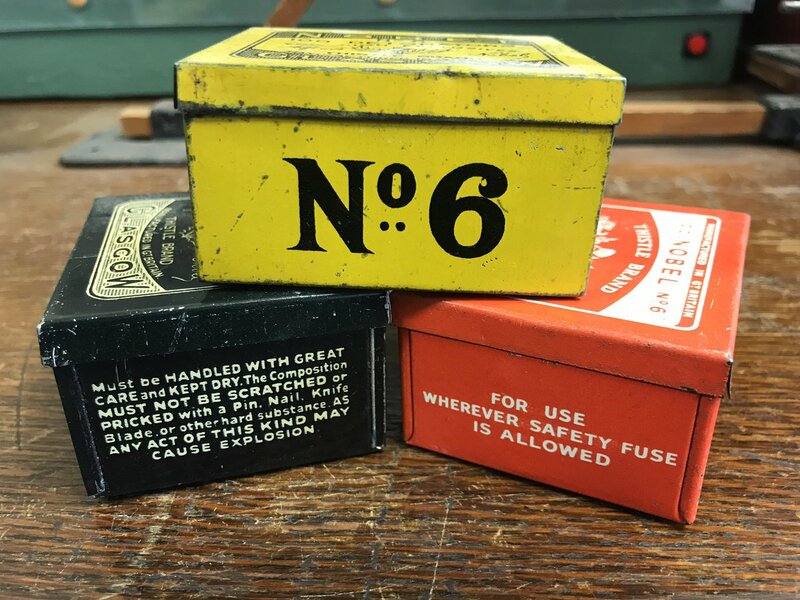 Glass lantern slides from Nobel’s Explosives, Ardeer. 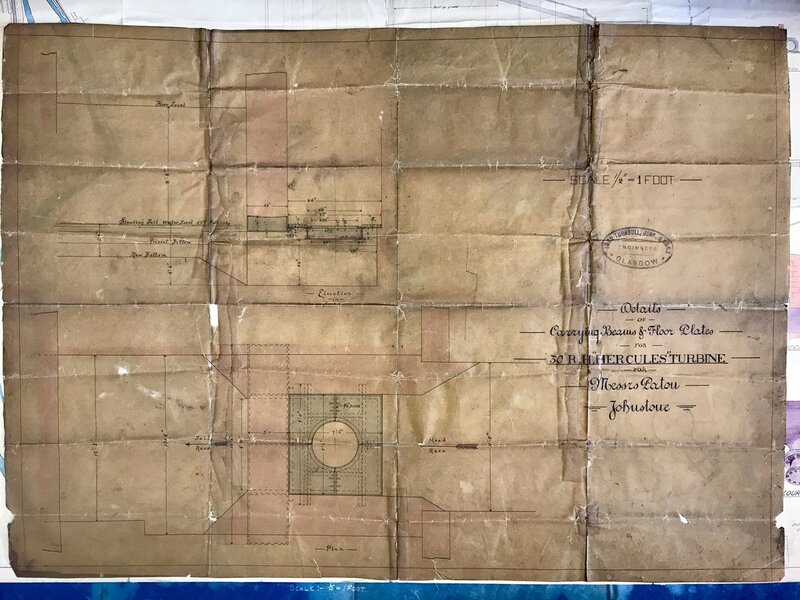 Half hull model of the Invincible, built by Tod & Macgregor in 1844. 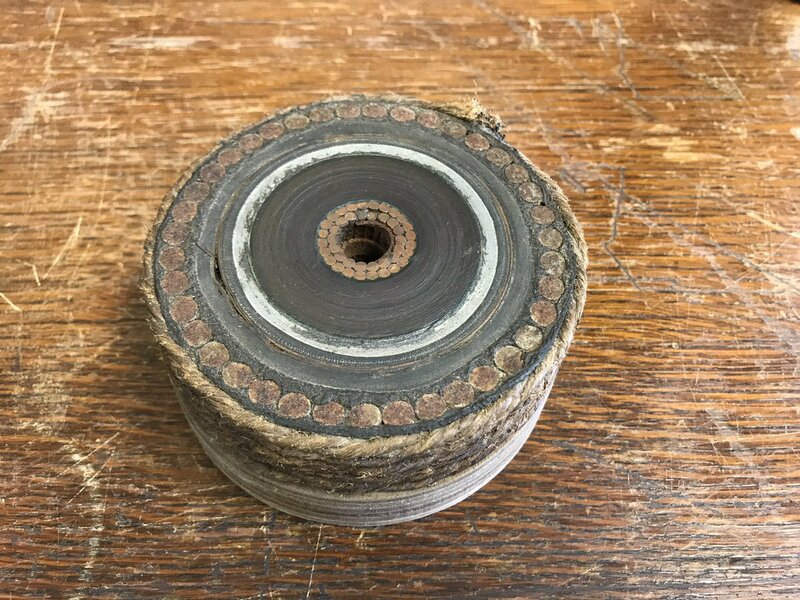 Section of submarine cable, cut underwater by shaped charge. 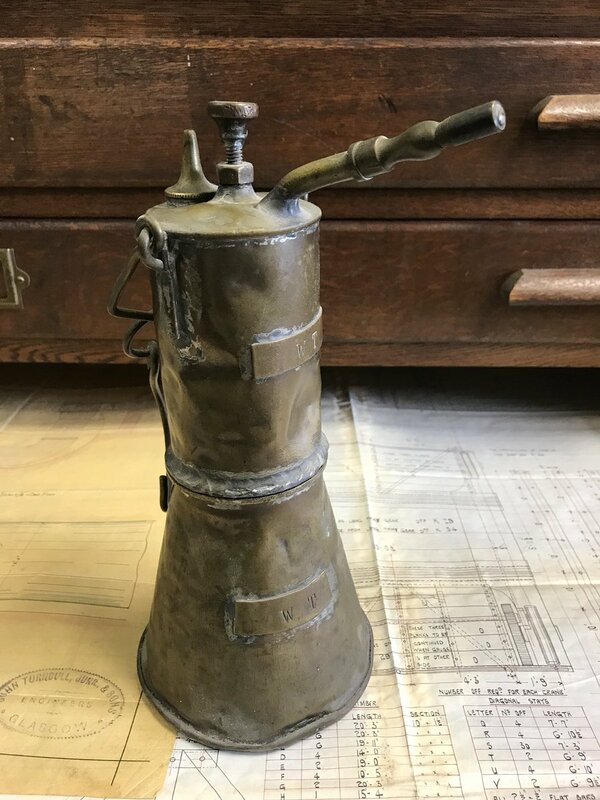 Acetylene lamp, probably from a shipyard. 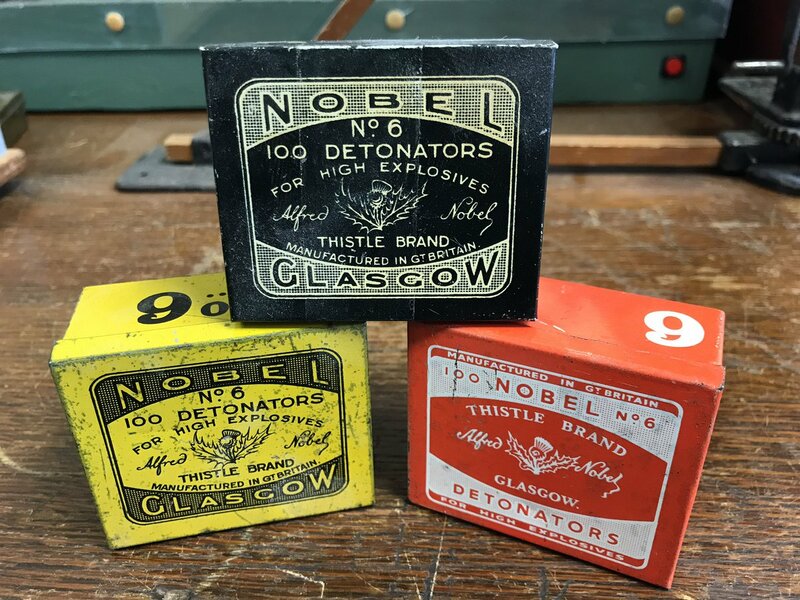 Detonator tins from Nobel’s Explosives, Glasgow. 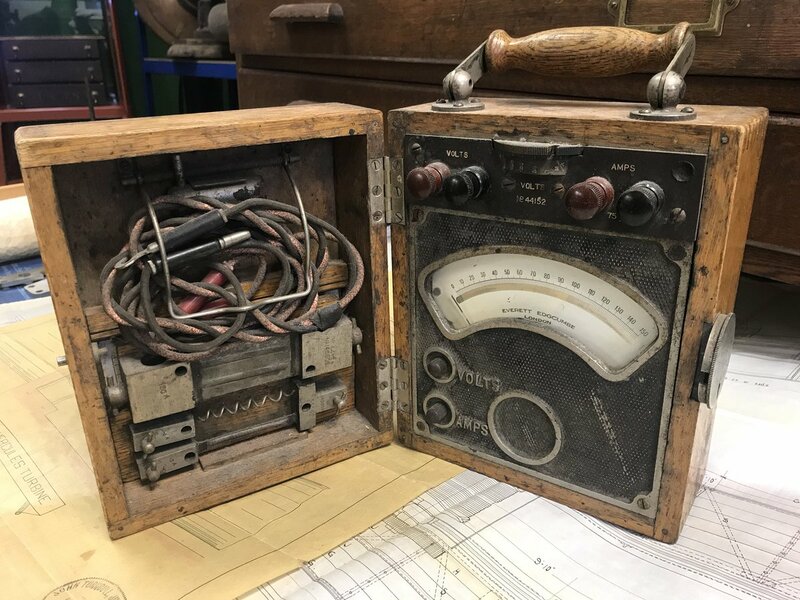 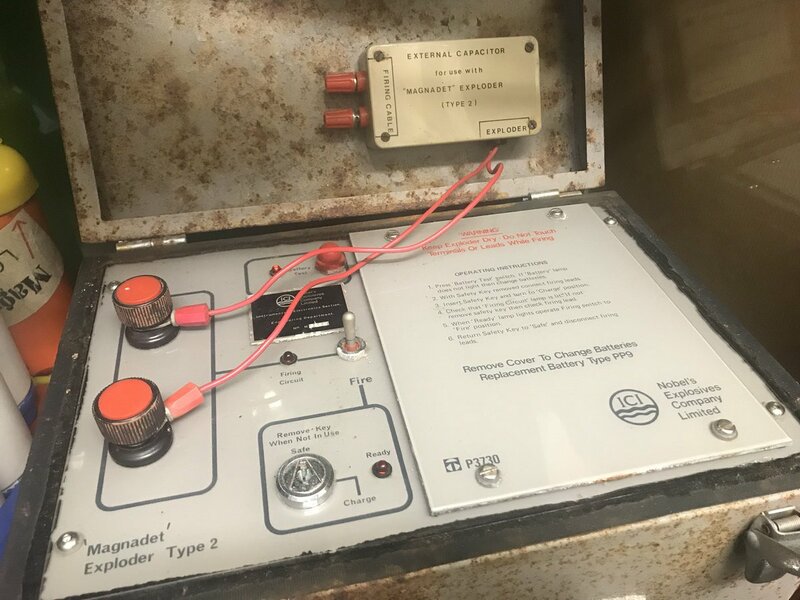 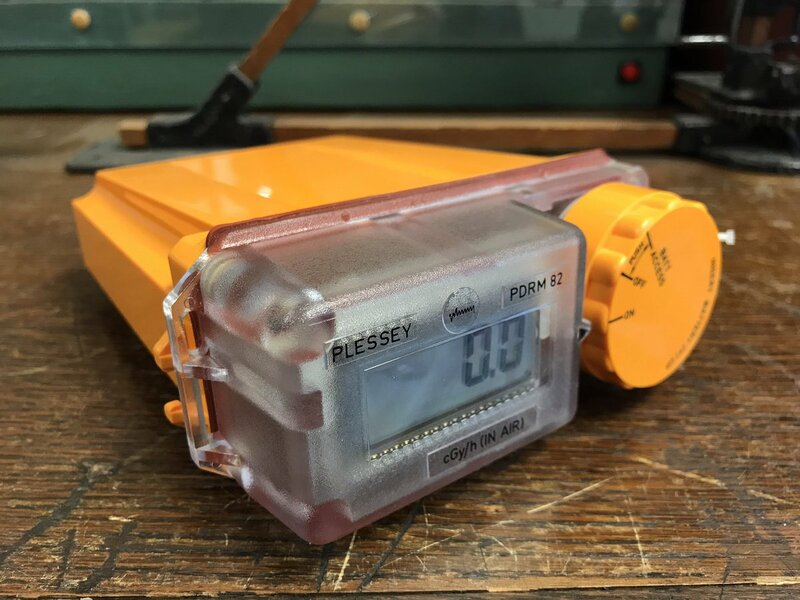 Electrical test meter from Nobel’s Explosives. 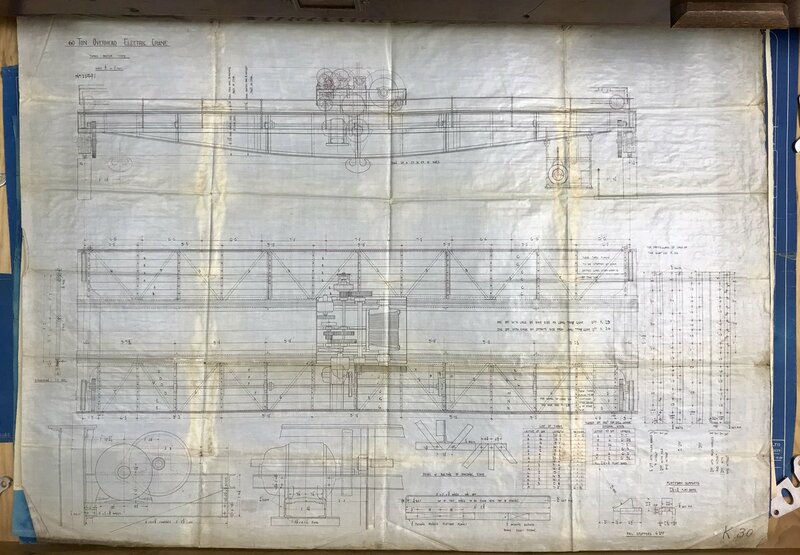 Plan of a 60-ton travelling crane, maker unknown. 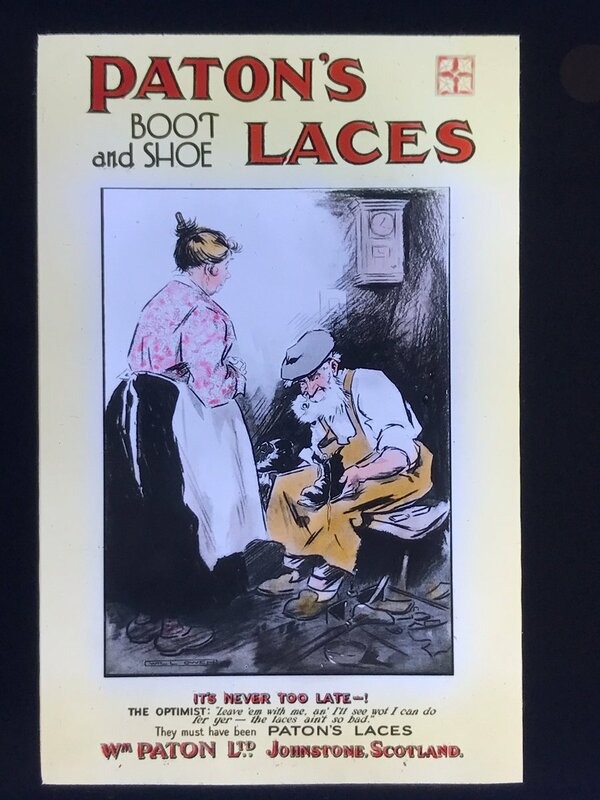 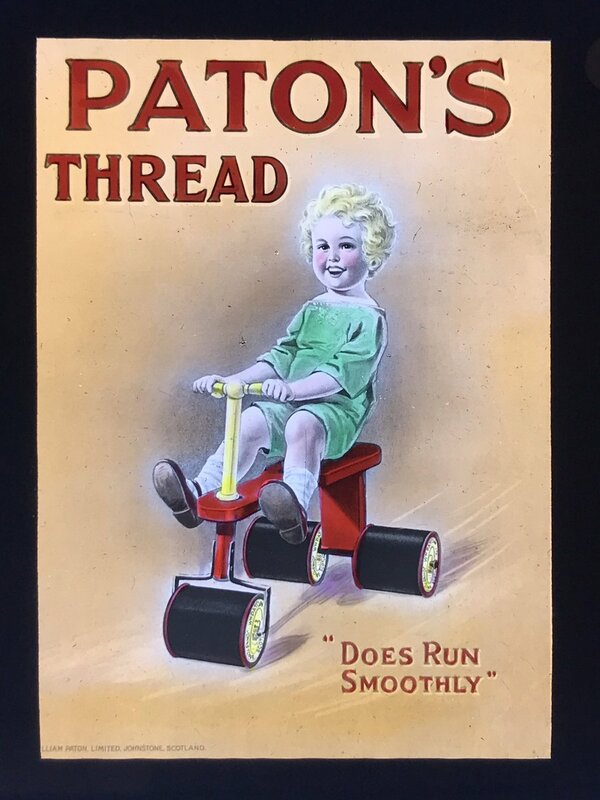 Advertising Lantern Slides from Paton’s of Johnstone. 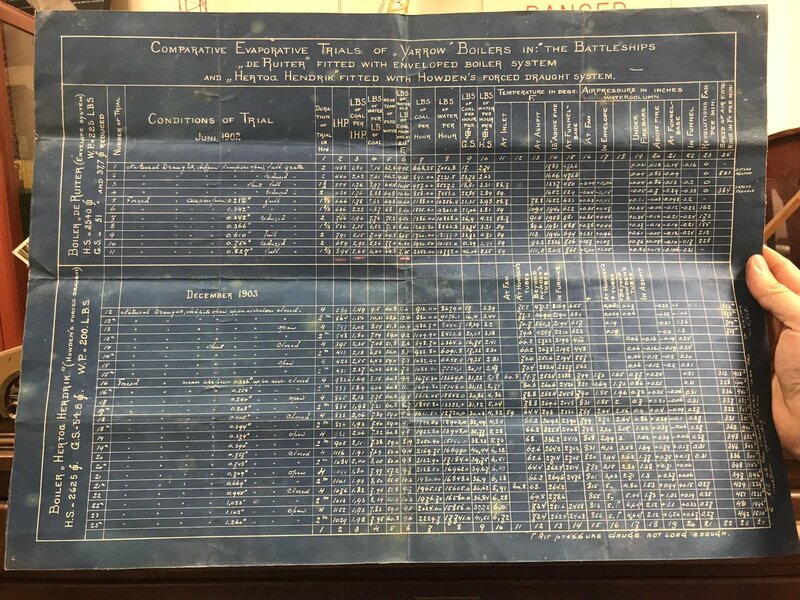 Testing data of Yarrow boilers and Howden equipment on battleships, 1903. 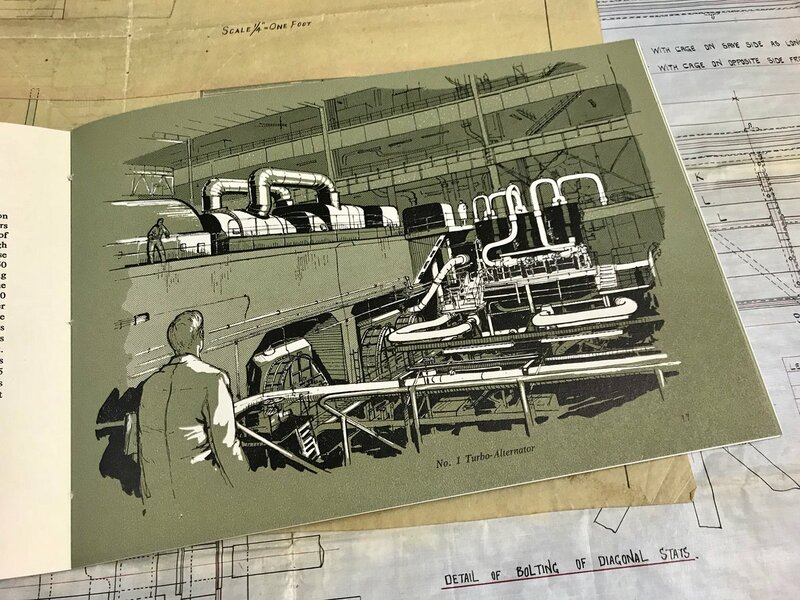 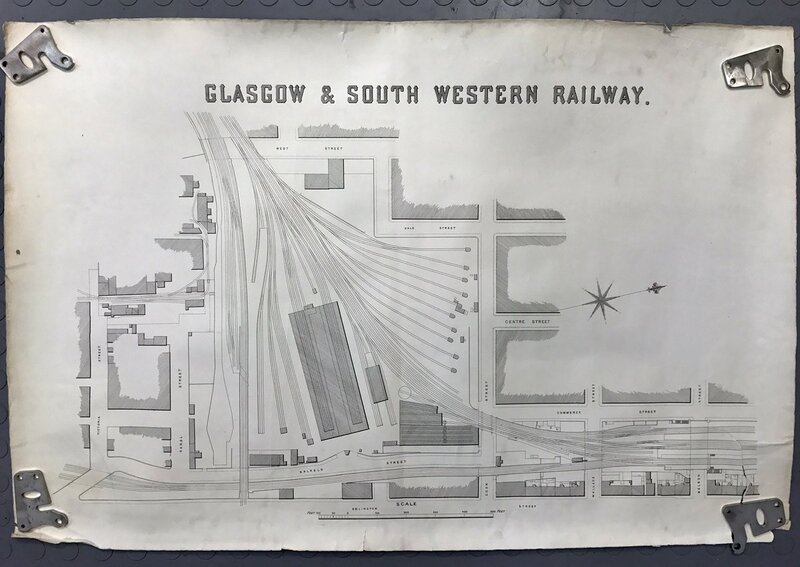 Drawings from Howden’s Engineering Works, Glasgow. 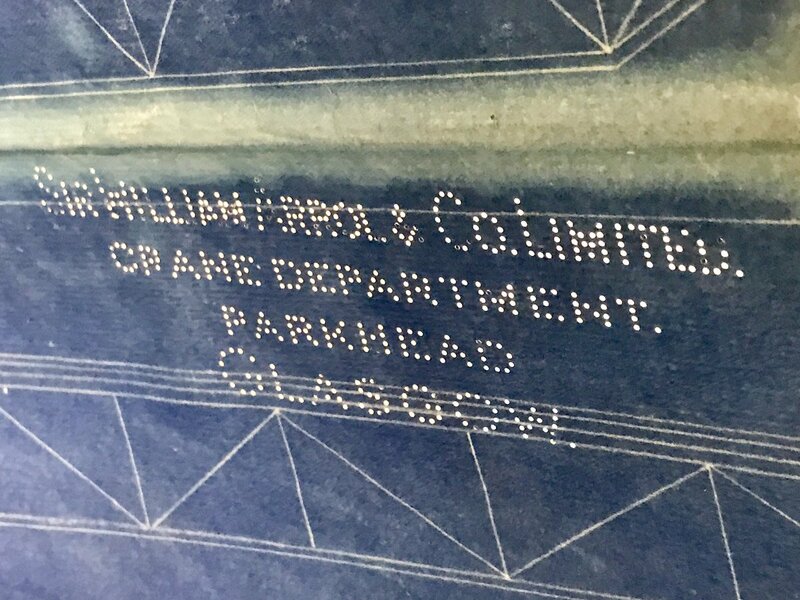 Miscellany from the Meadowside Shipyard at Partick, Glasgow. 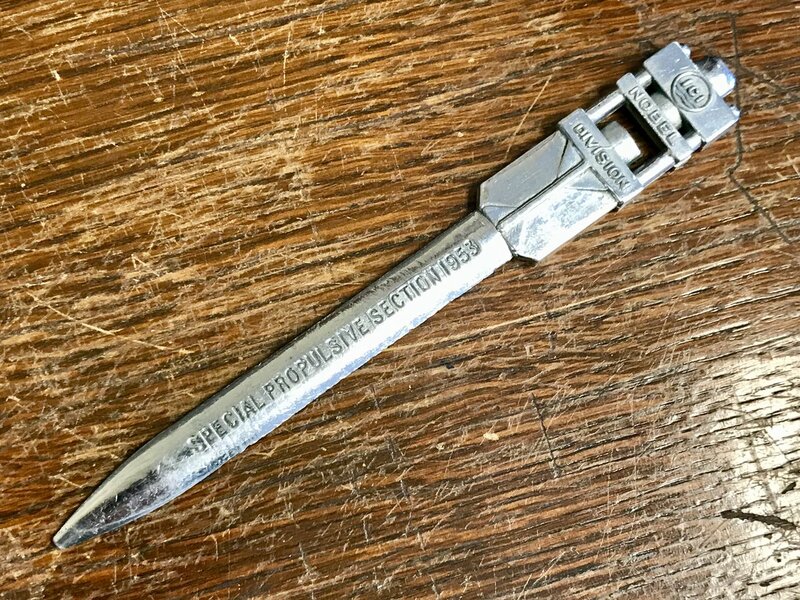 Letter opener from Nobel’s. 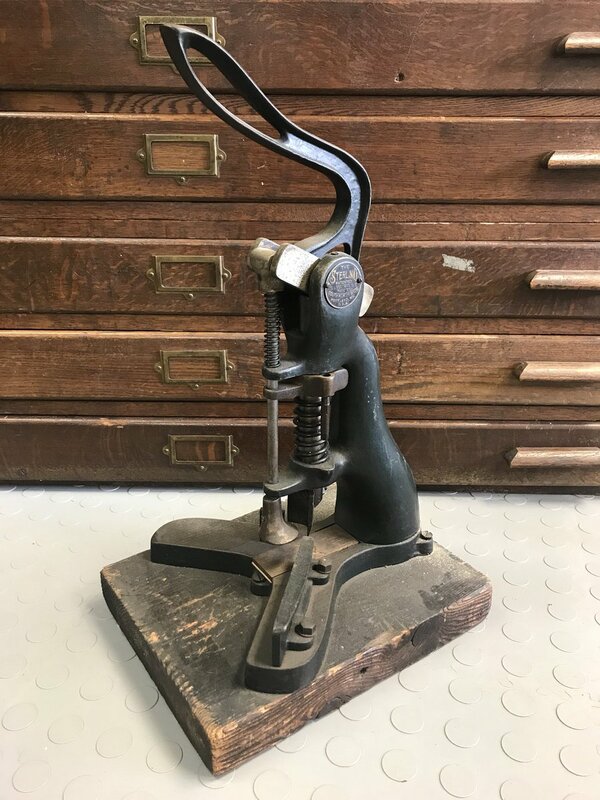 The top is in the shape of a press. 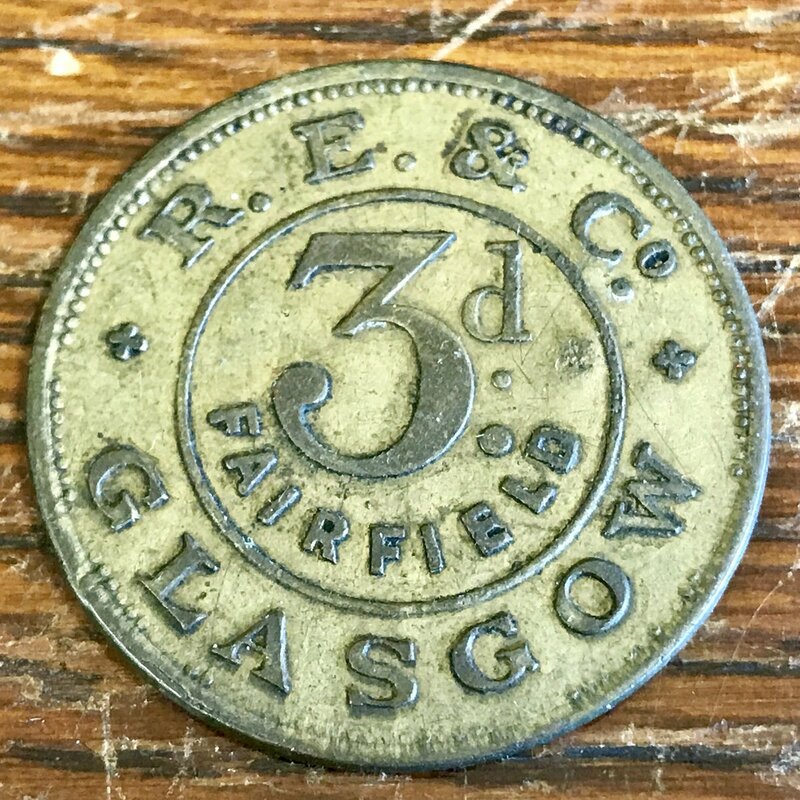 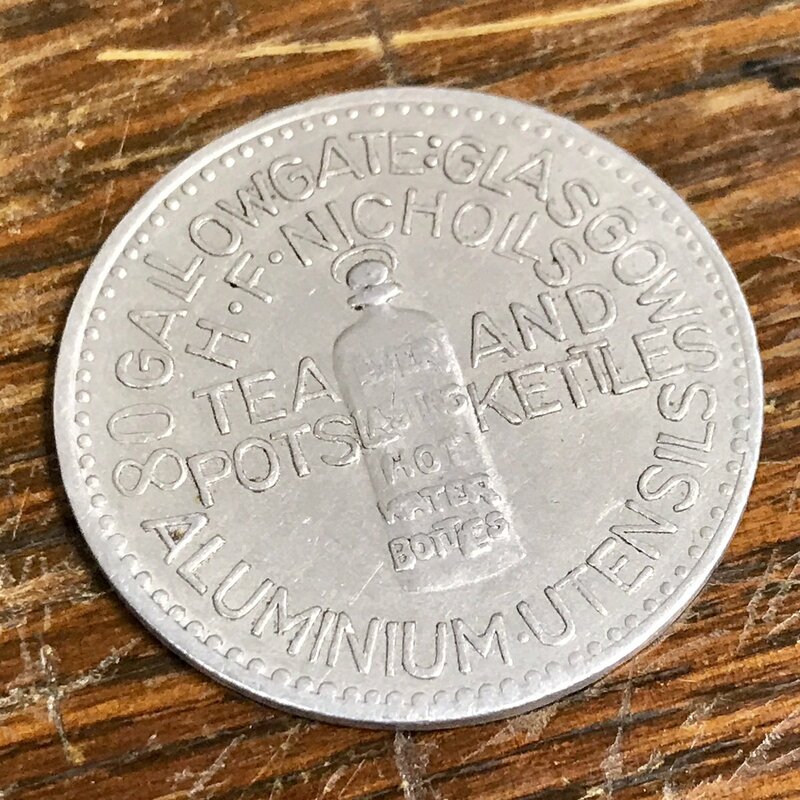 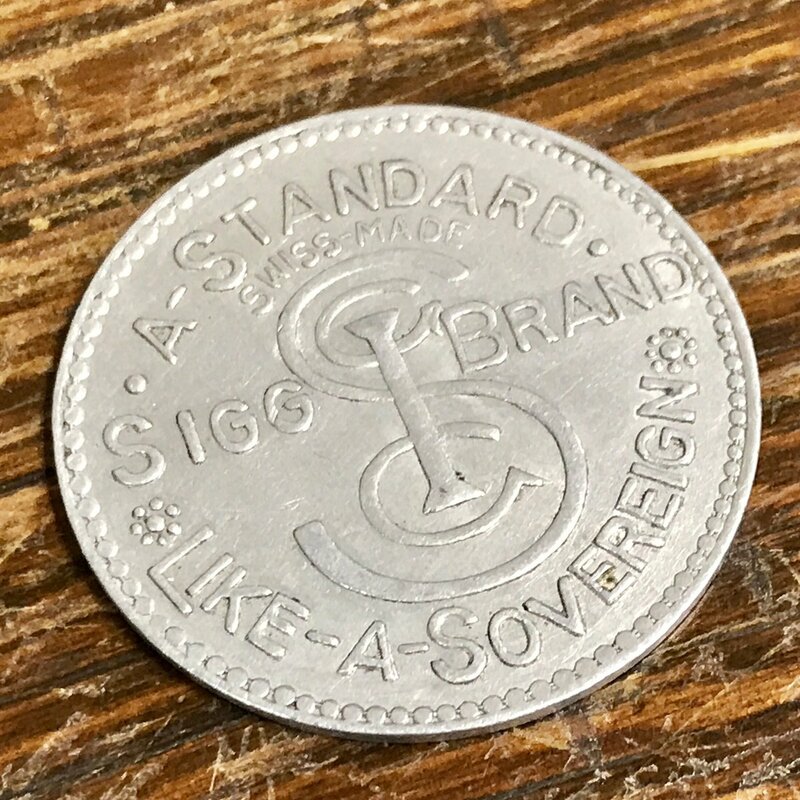 Sigg aluminium advertising token for HF Nicholls, Gallowgate, Glasgow. 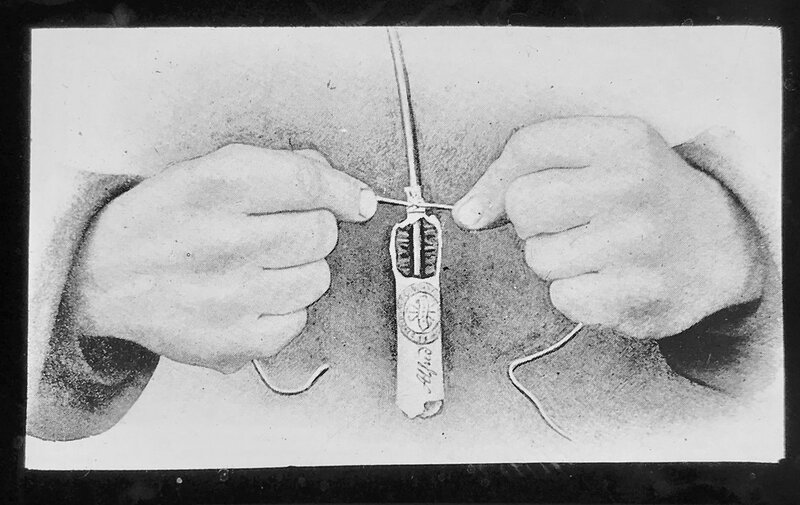 1946 Sailmaker’s Palm, used to push needles through tough fabric. 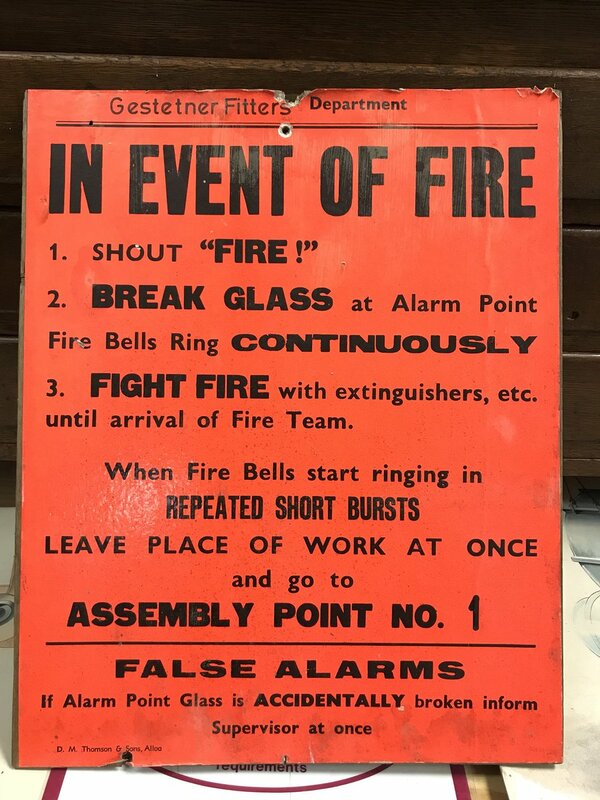 Fire warning sign from the Kilbagie Paper Mill. 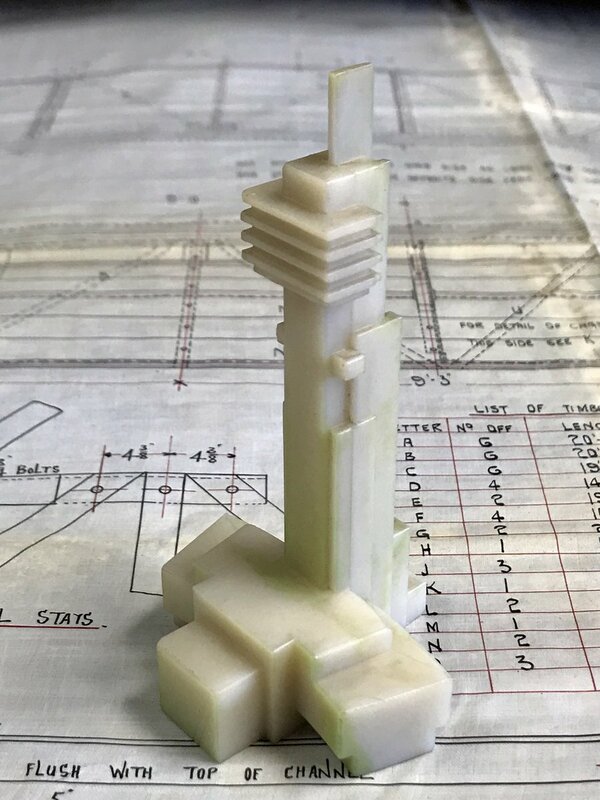 A Bakelite model of Tait Tower from the 1938 Empire Exhibition in Glasgow. 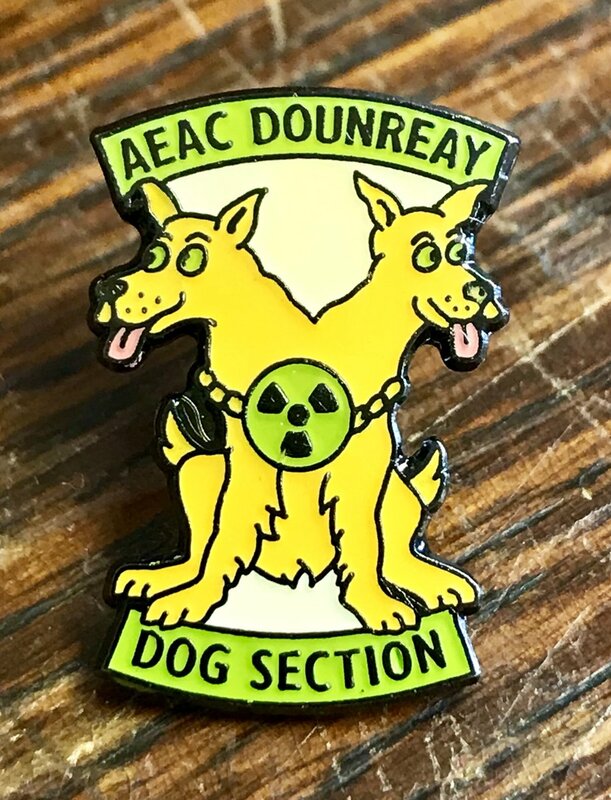 Badge from the Atomic Energy Authority Constabulary Dounreay Dog Section. 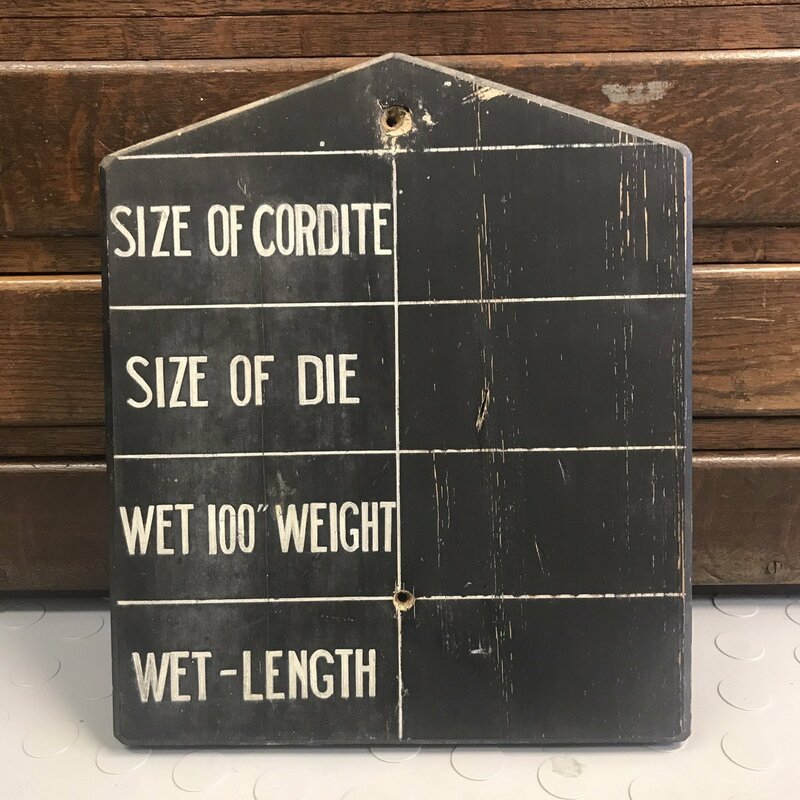 Board from a cordite pressing house, Nobel’s Explosives. 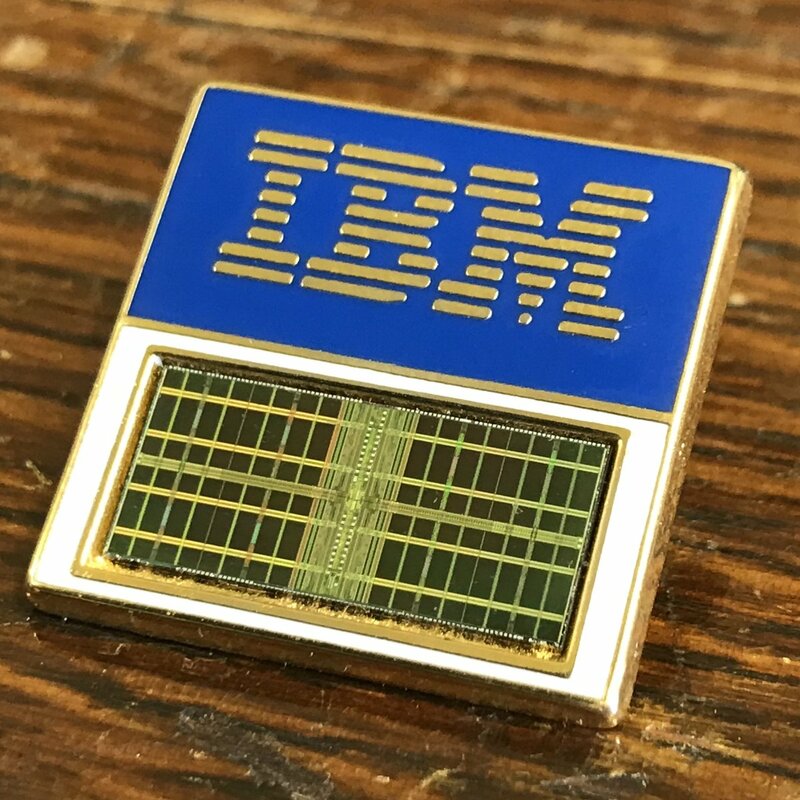 An IBM badge with a real microchip on it. 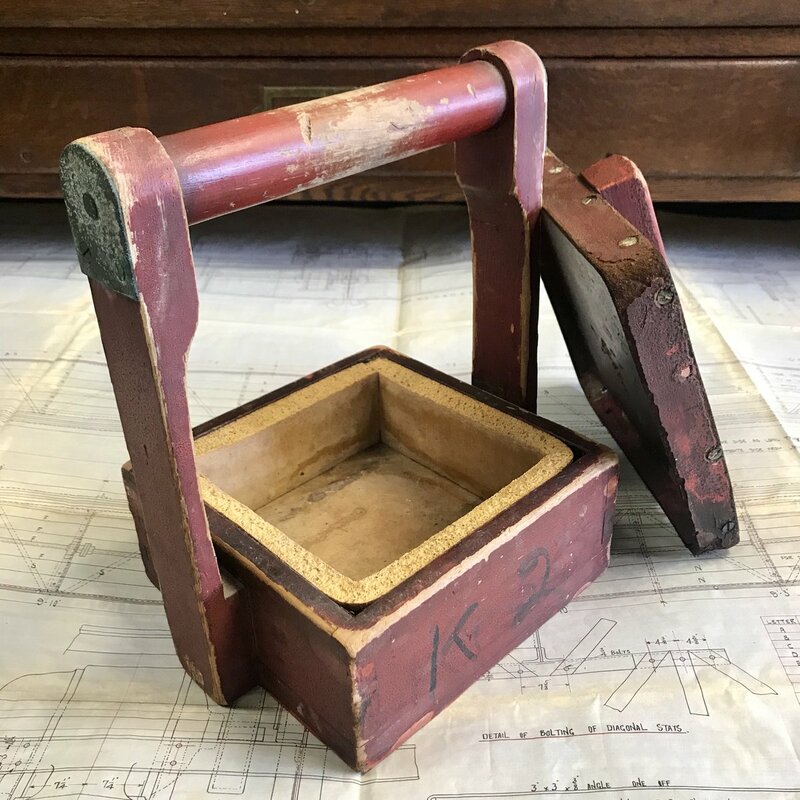 Padded box for carrying nitroglycerine samples, from Nobel’s Explosives, Ardeer. 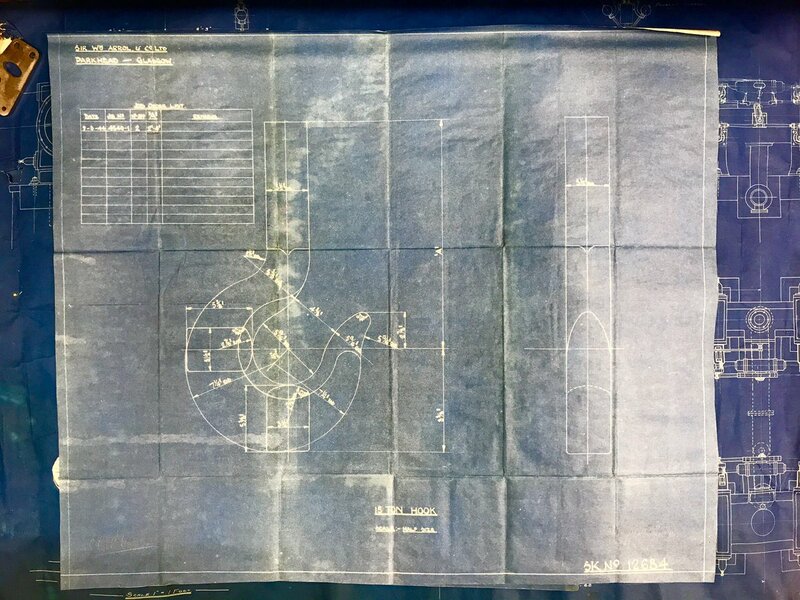 Plan of a water turbine for Paton’s mill, Johnstone. 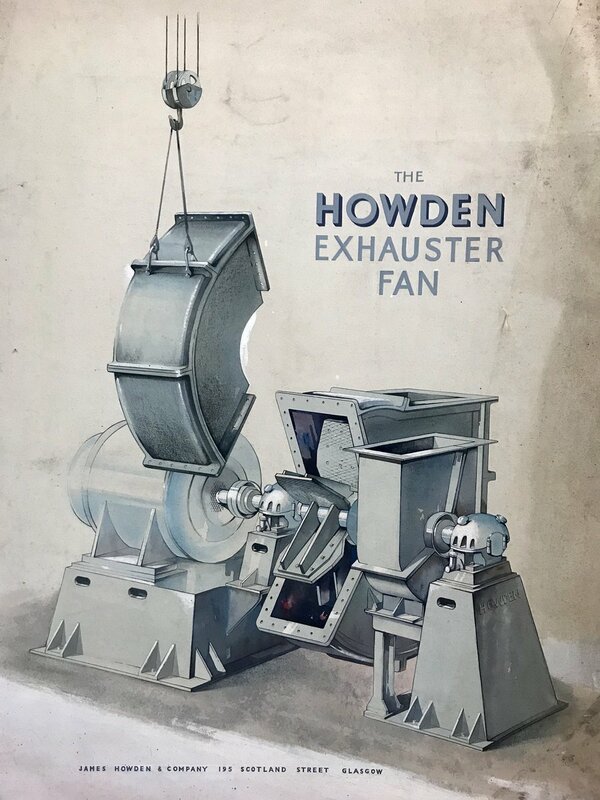 Hand coloured image of a large fan made by Howden’s of Scotland Street, Glasgow. 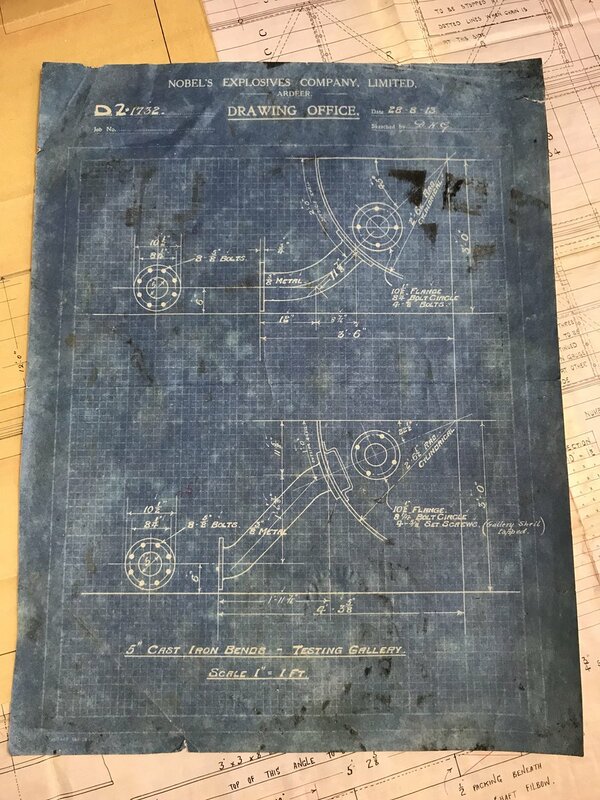 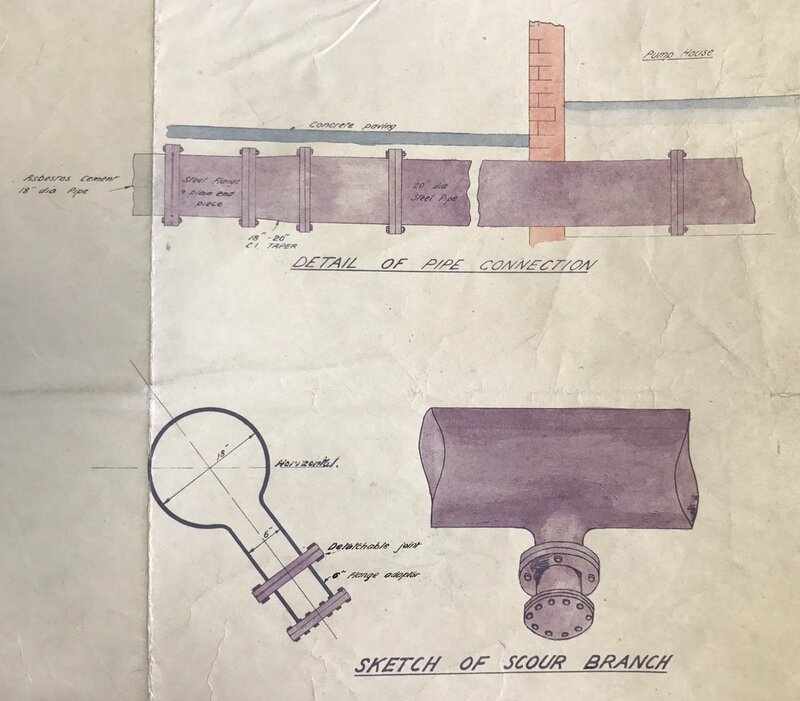 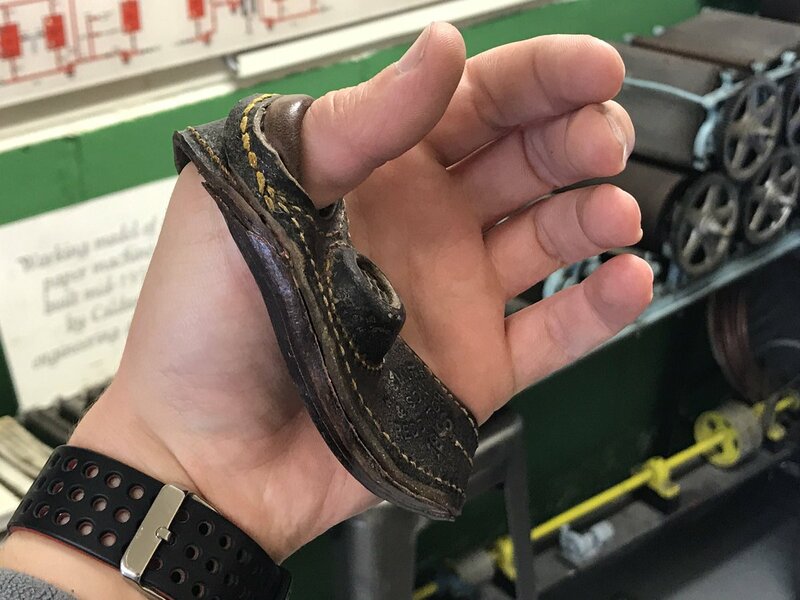 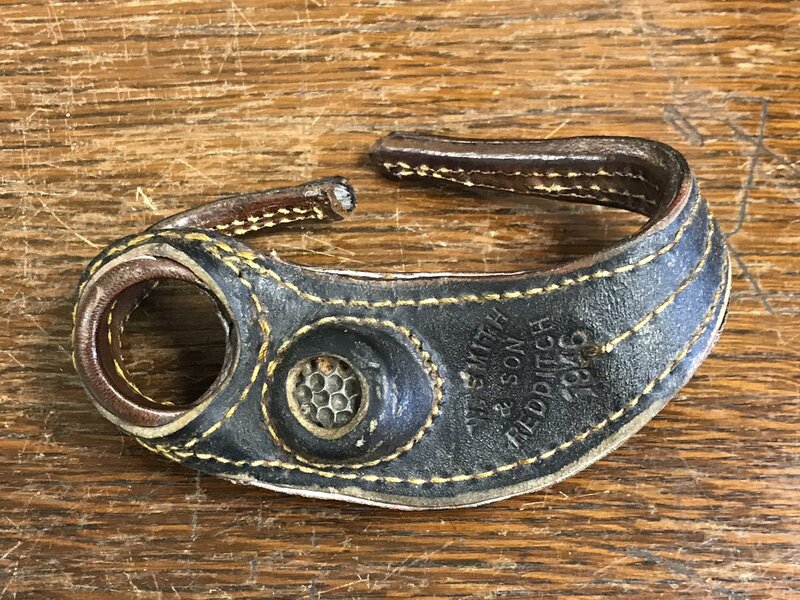 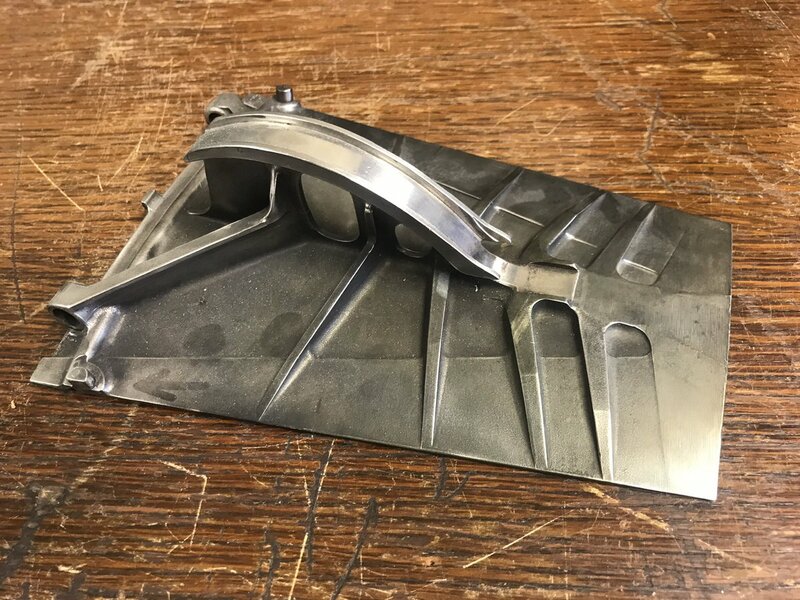 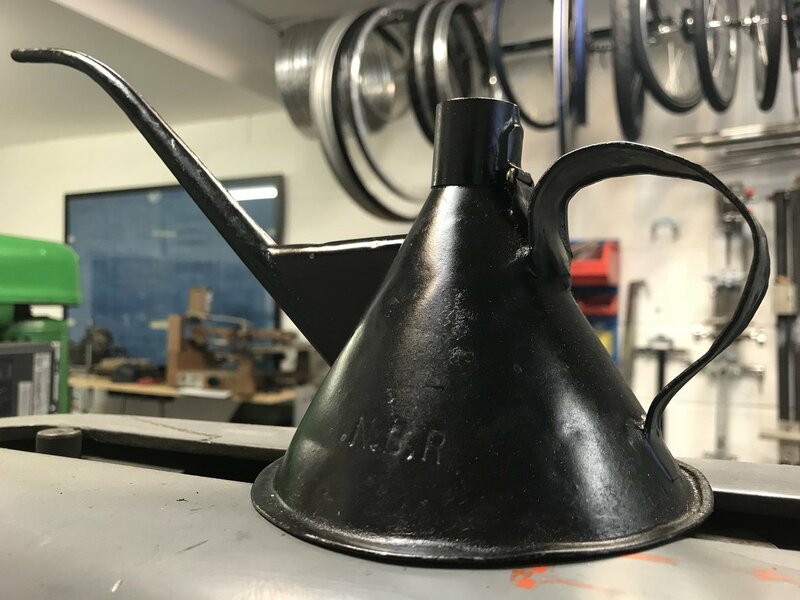 Blueprint of a crane hook made by the famous Glasgow firm of Sir William Arrol & Co.
Titanium afterburner flap from a military jet engine. 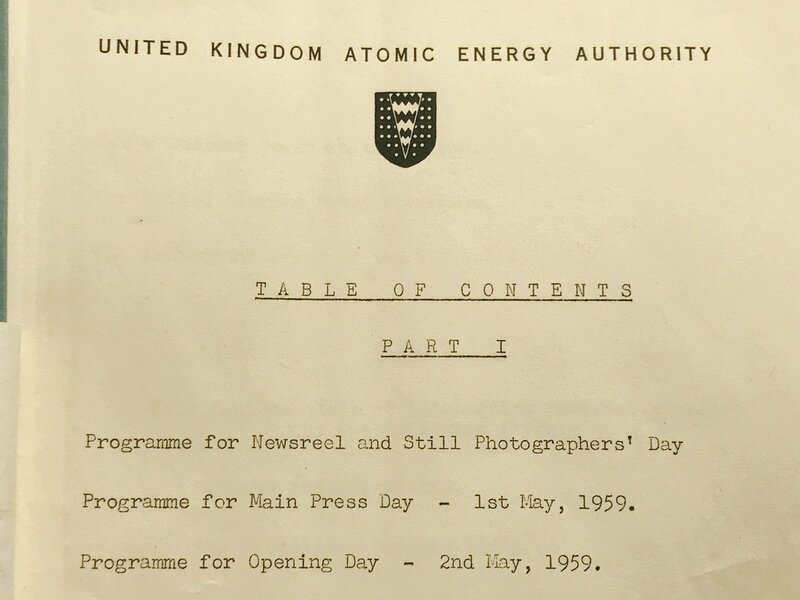 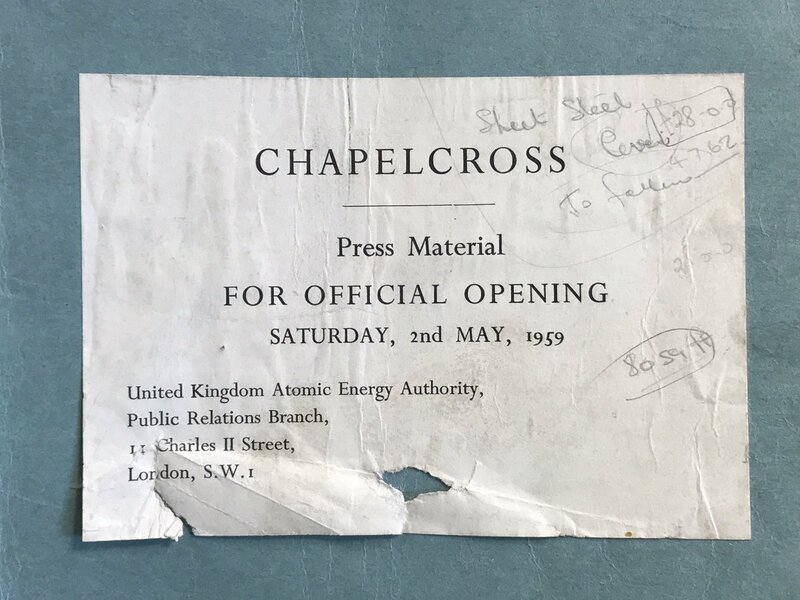 Press pack for the opening of Chapelcross nuclear power station. 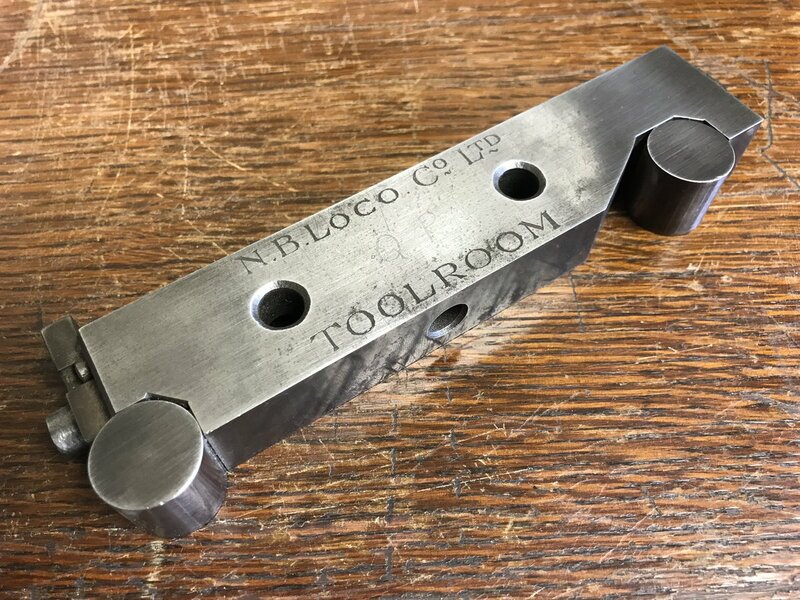 ools from Lang Lathes. 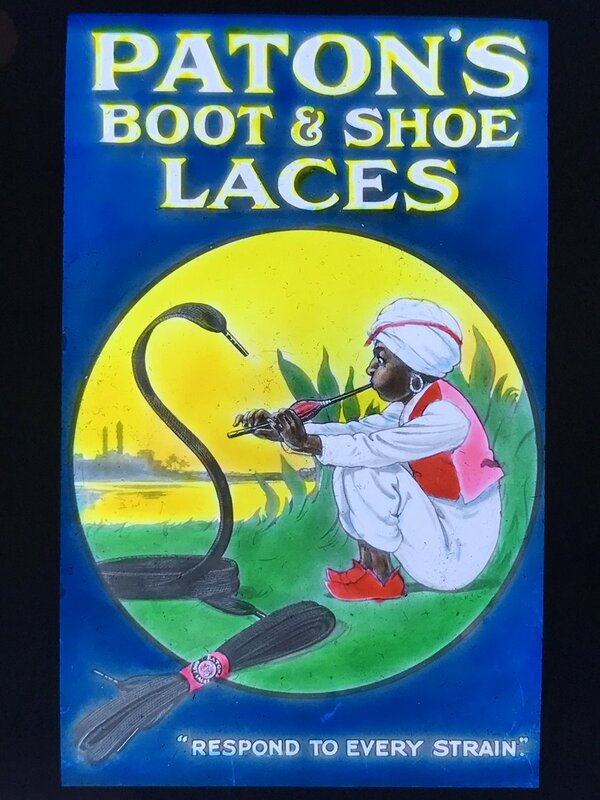 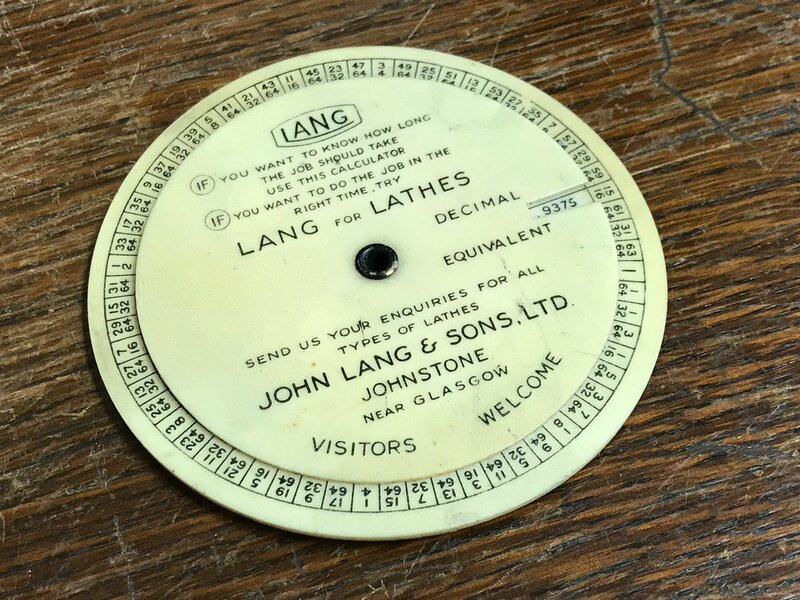 Lang’s of Johnstone were founded in 1873, and lasted until 1979. 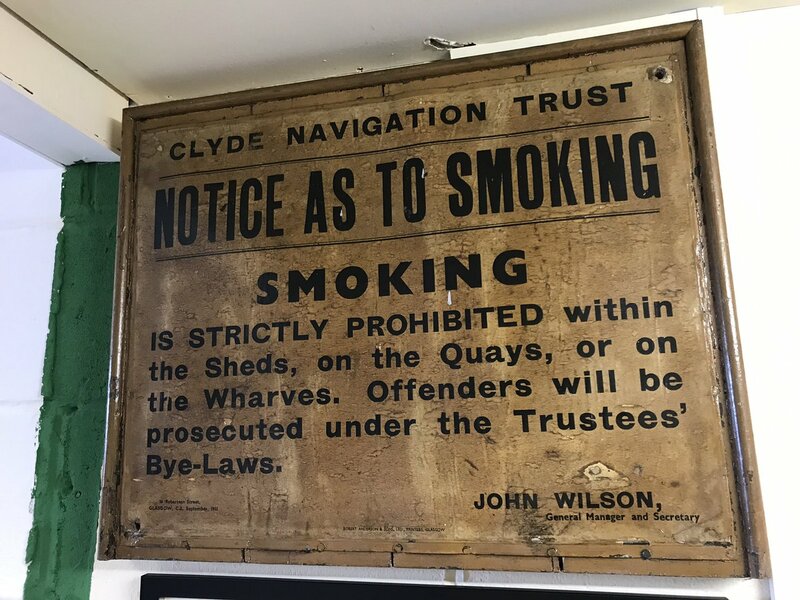 No Smoking sign and an old school poster of the Clyde docks, 1950s. 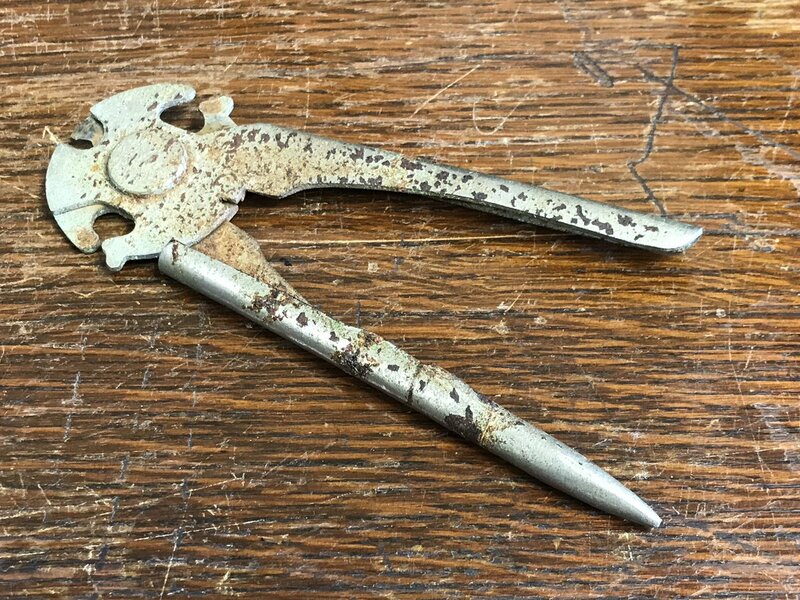 Detonator pliers from Nobel’s Explosives, Ardeer. 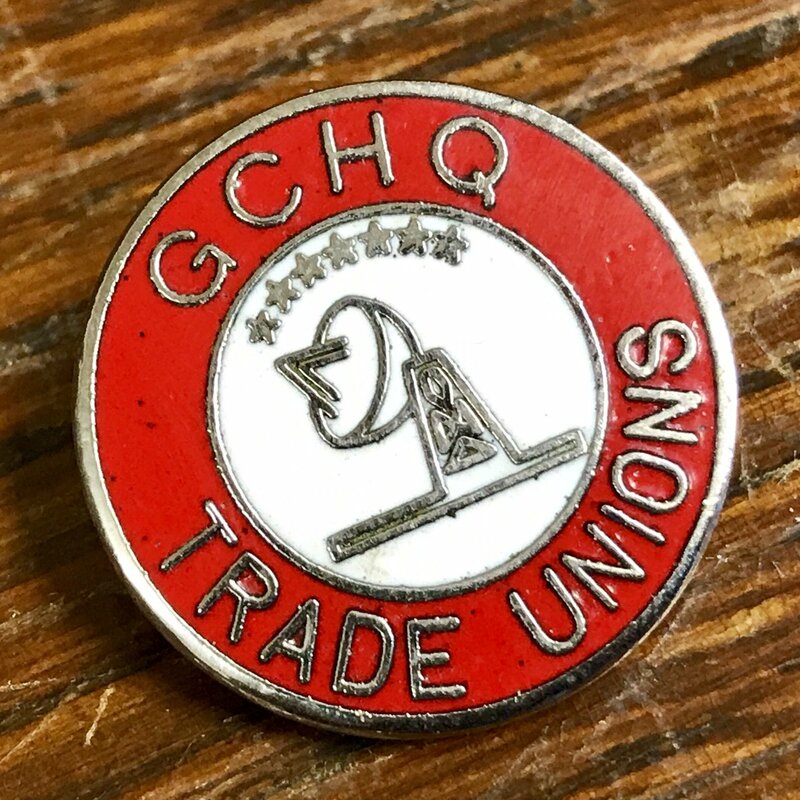 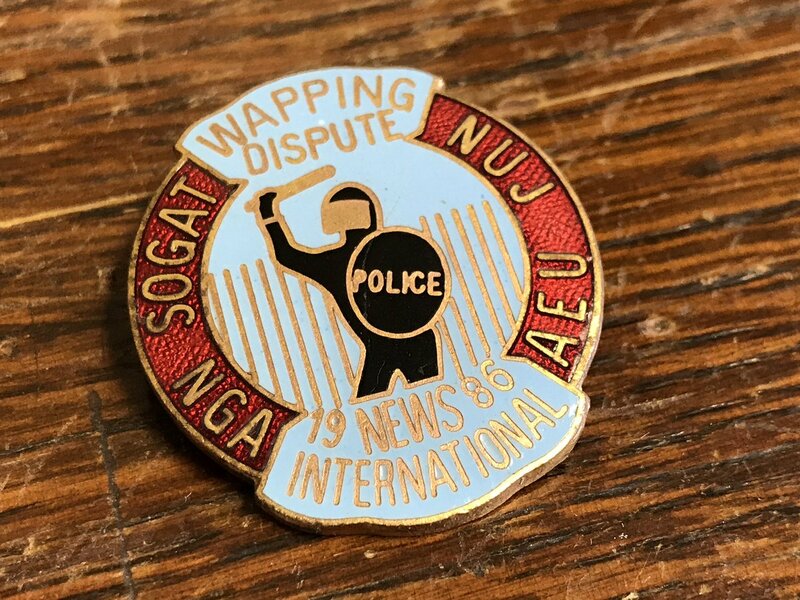 Enamel badge from the News International Wapping disputes in 1986. 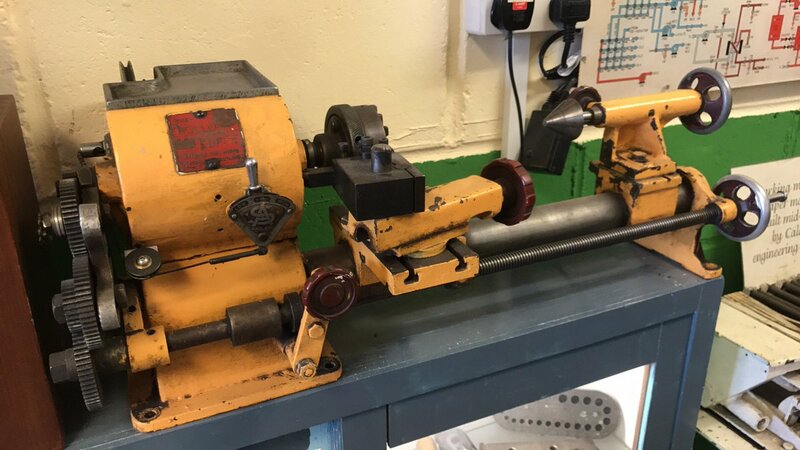 Rollo Elf lathe. 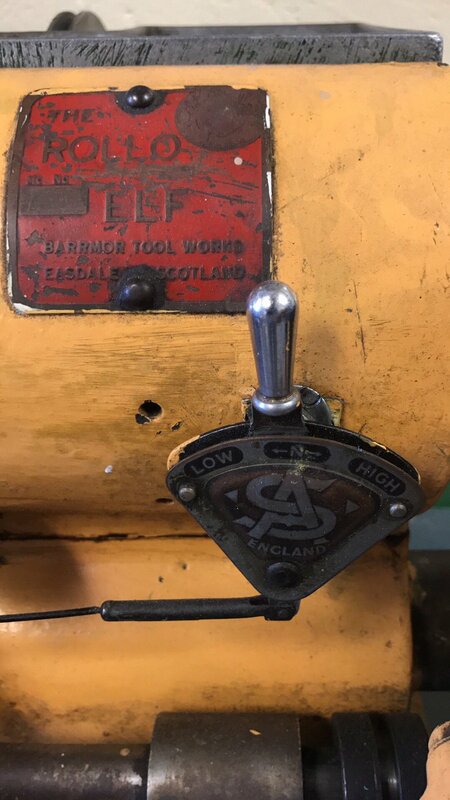 Made in the Highlands of Scotland, this lathe used a Sturmey Archer hub. 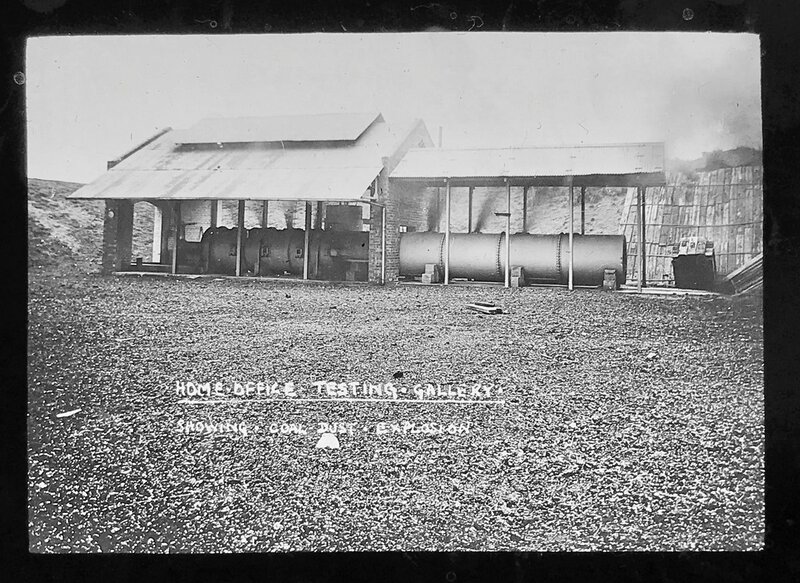 Emergency breathing apparatus from a coal mine. 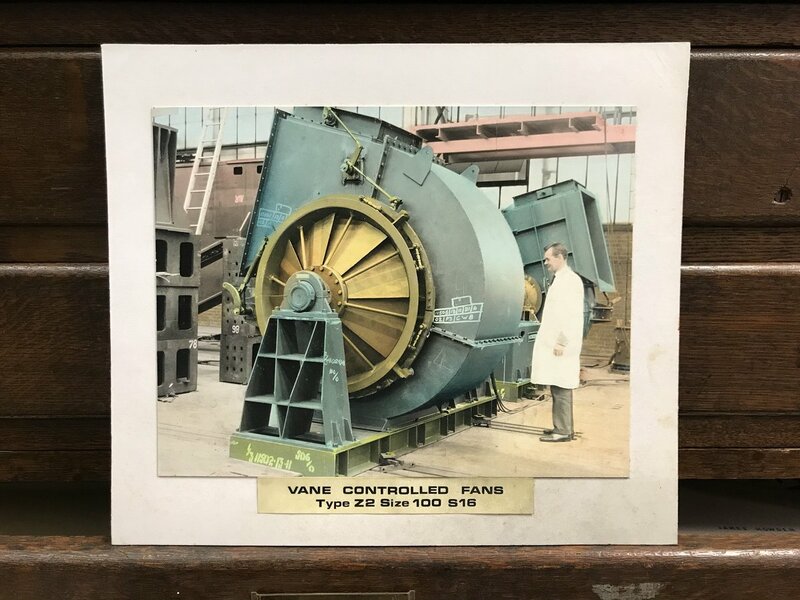 Model paper machine from Caldwells mill, Inverkeithing. 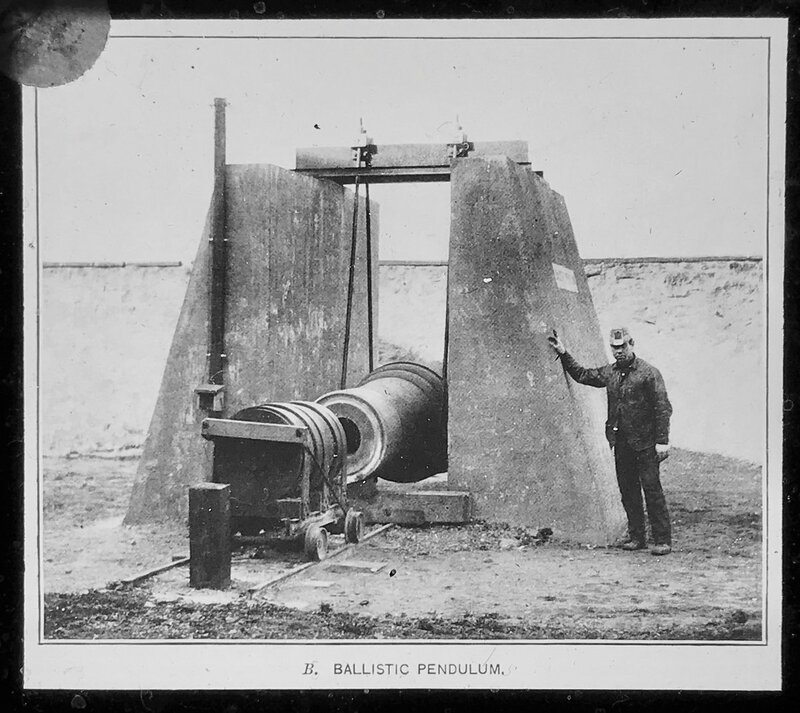 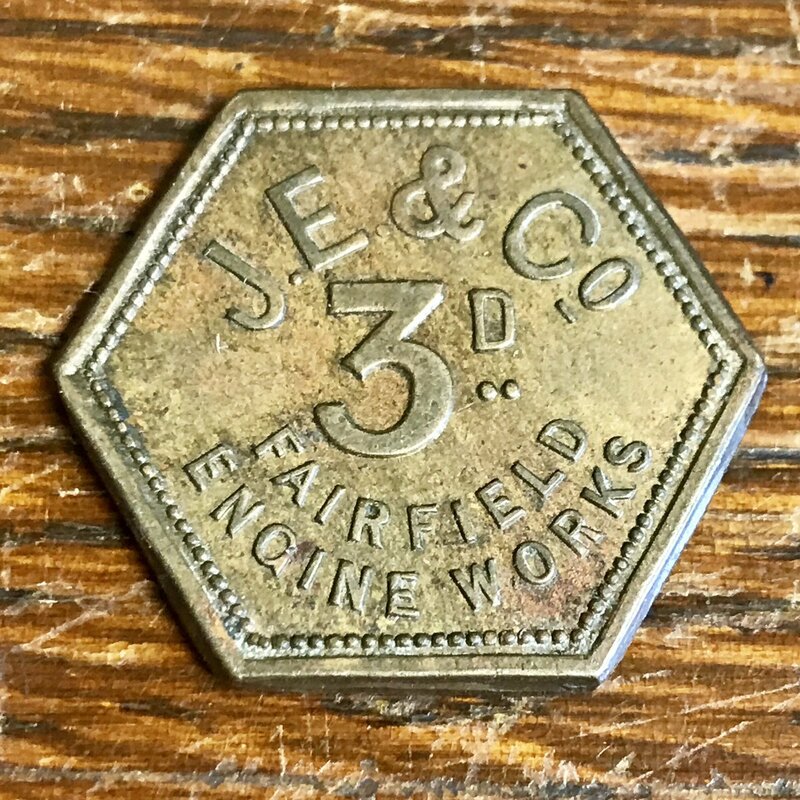 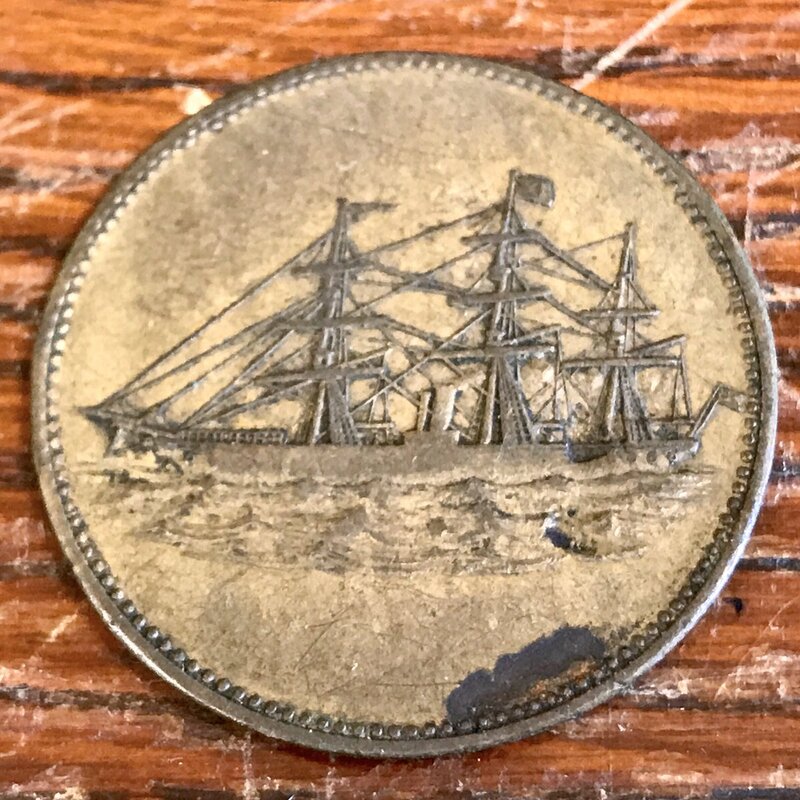 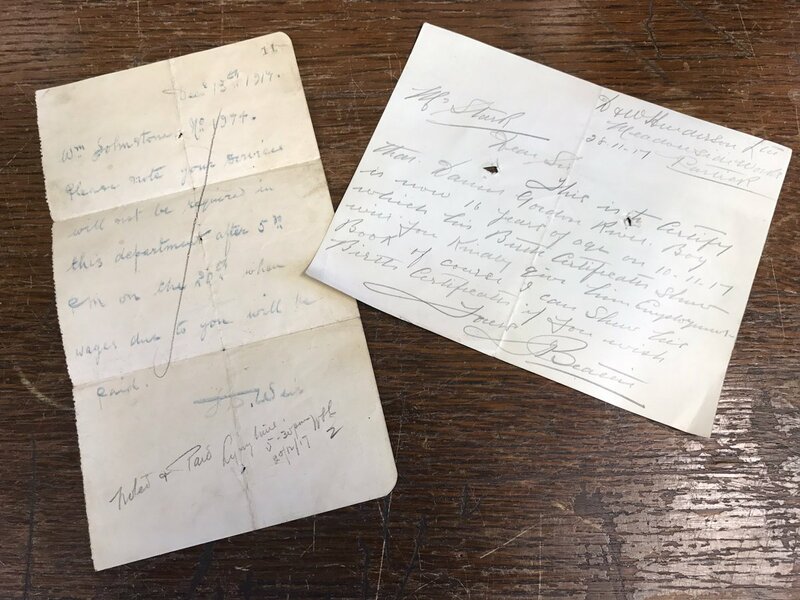 Pay token from Robert Elder’s Fairfield Shipyard. 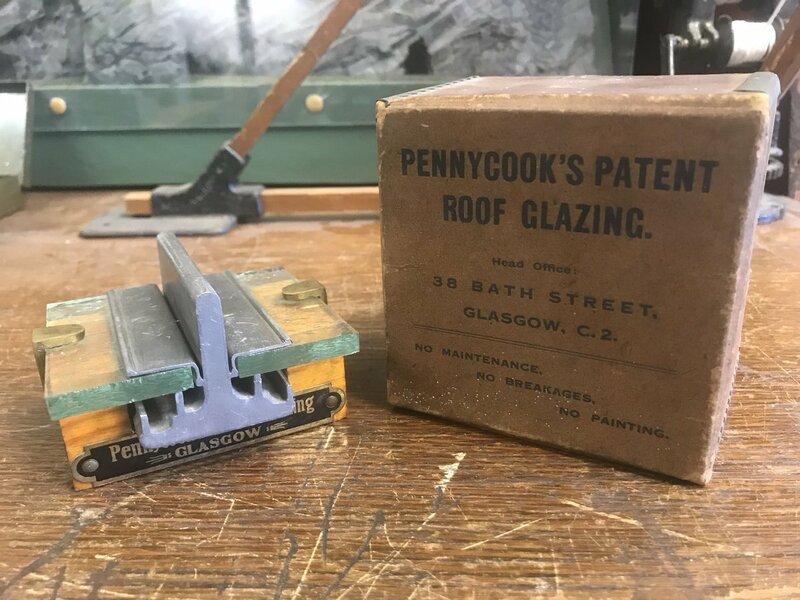 Founded in 1880, this company specialised in large glass roofs, they’re responsible for the roofs of Glasgow’s Central Station and Edinburgh’s Waverley Station. 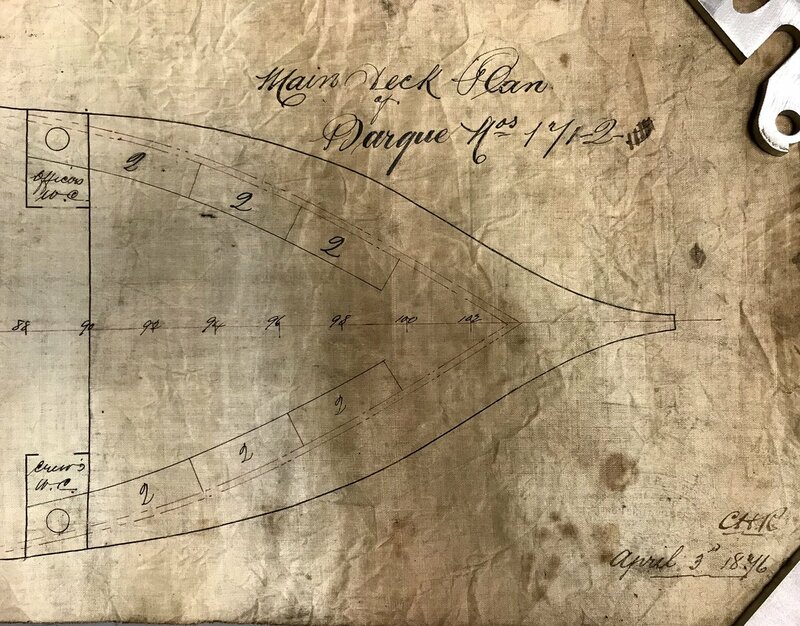 Plan of a 3-masted iron sailing ship built by D & W Henderson of Partick. 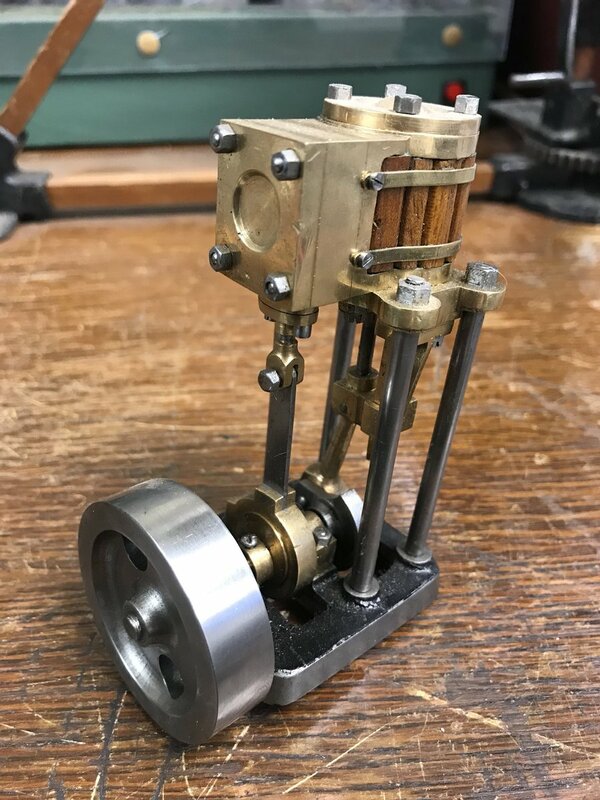 Small model steam engine, maker unknown. 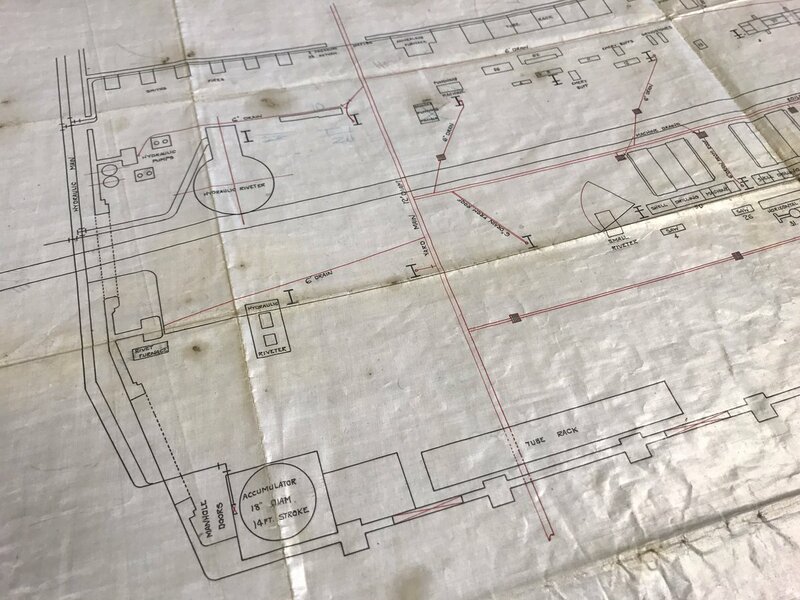 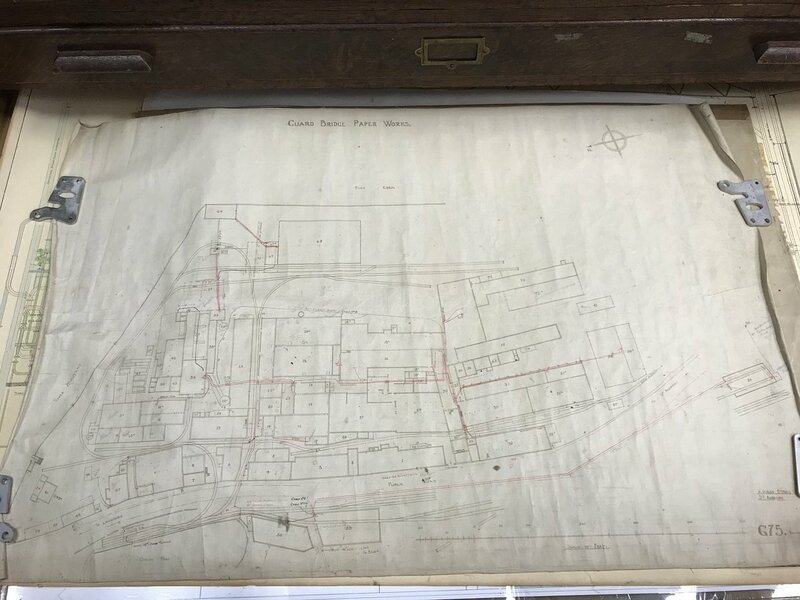 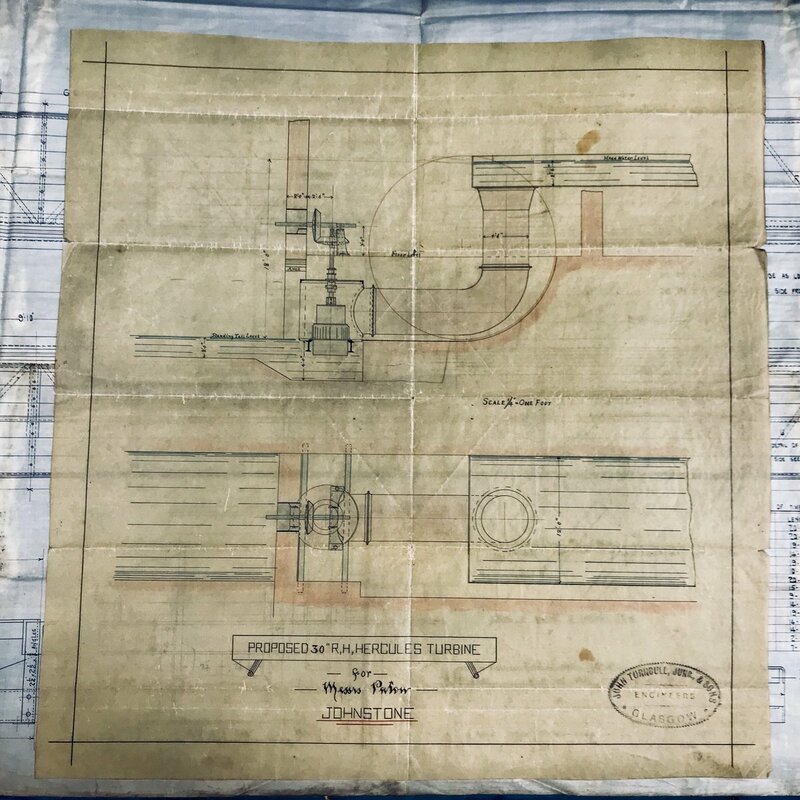 Plan of a water pipe at the Caldwell’s paper mill in Inverkeithing. 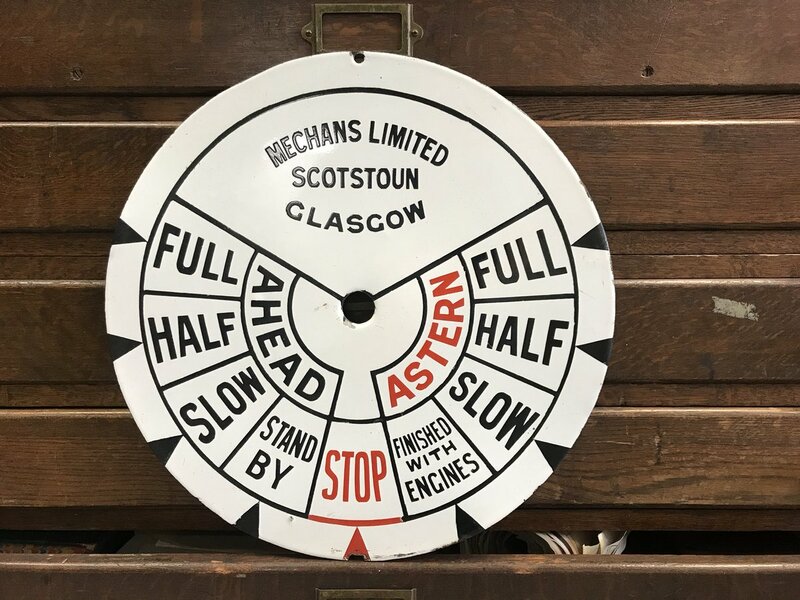 Ship’s telegraph face made by Mechans Ltd. of Scotstoun. 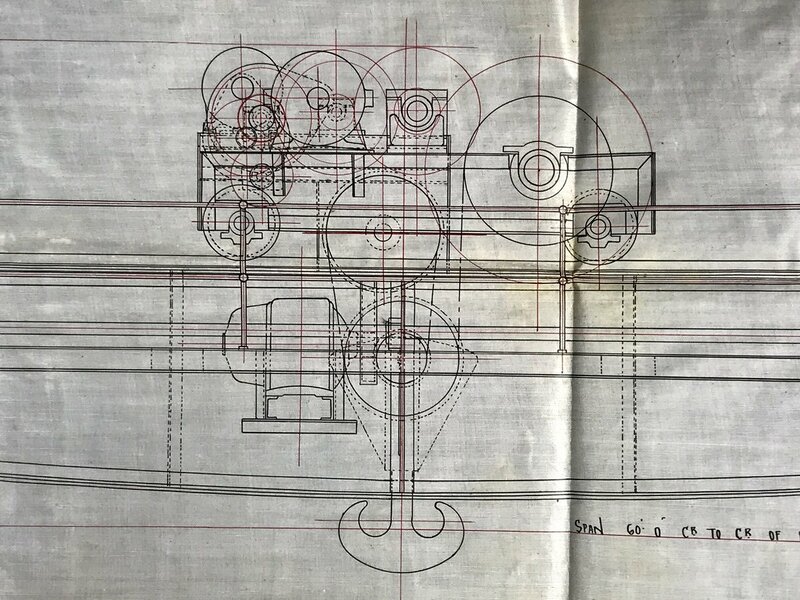 1913 drawing from Nobel’s Explosives, Ardeer. 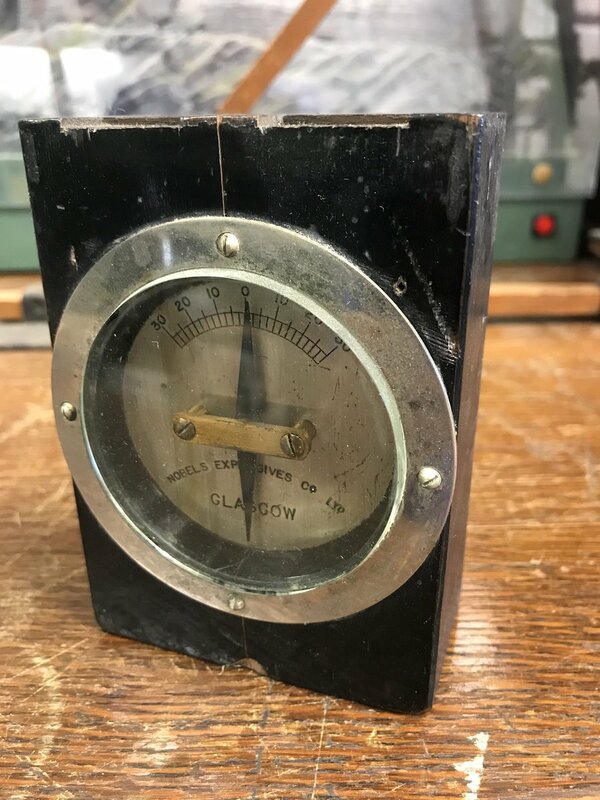 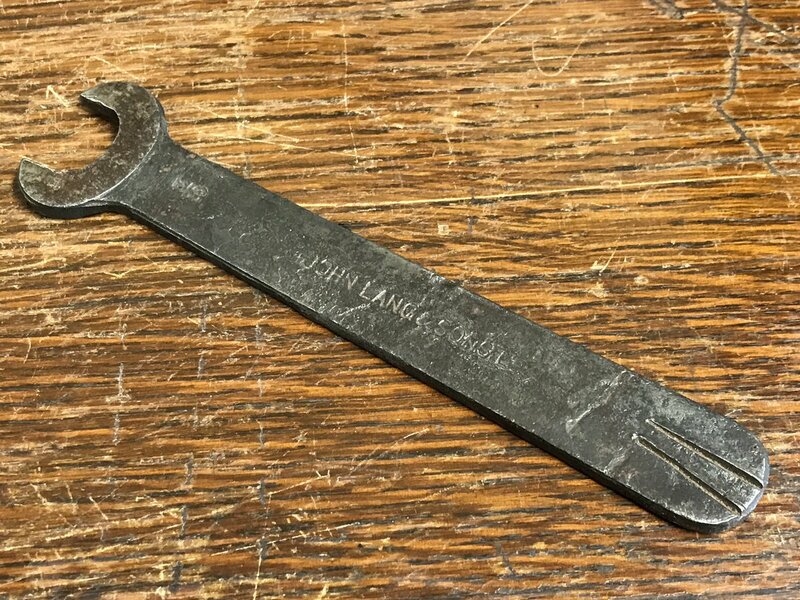 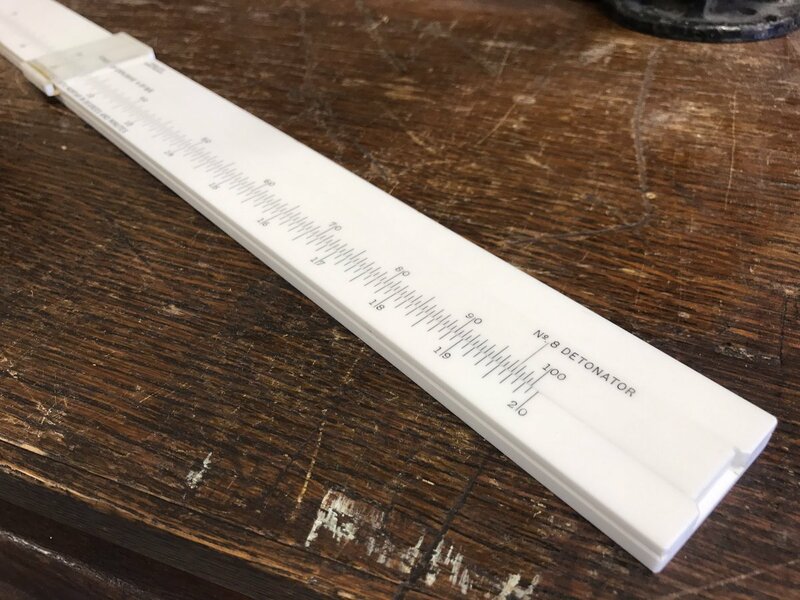 A Sine Bar from the toolroom of the North British Locomotive Company, Glasgow. 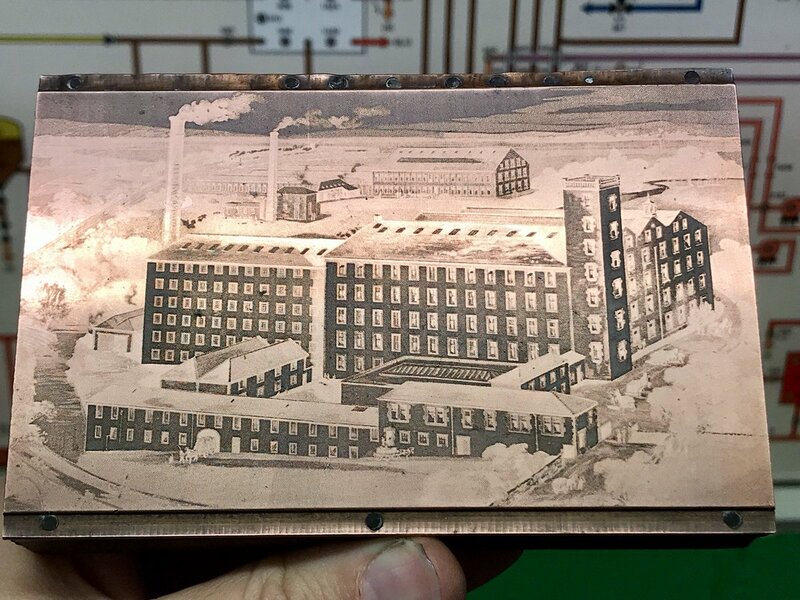 Printing plate of Paton’s Mill, Johnstone. 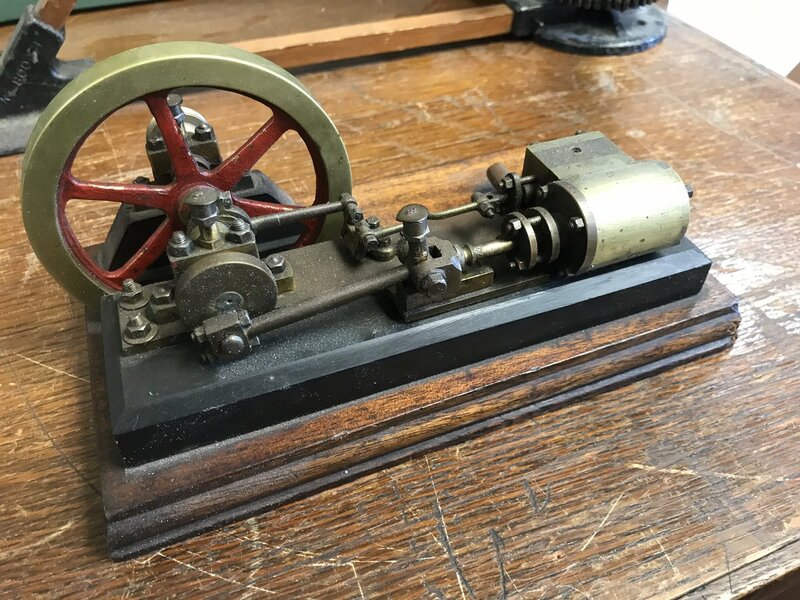 Model steam engine, maker unknown. 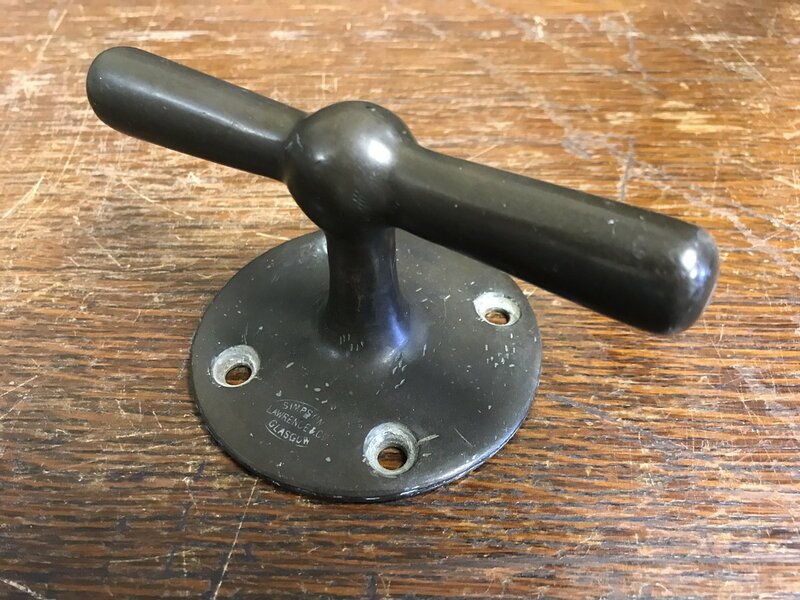 Brass handle made by Simpson Lawrence & Co of Glasgow. 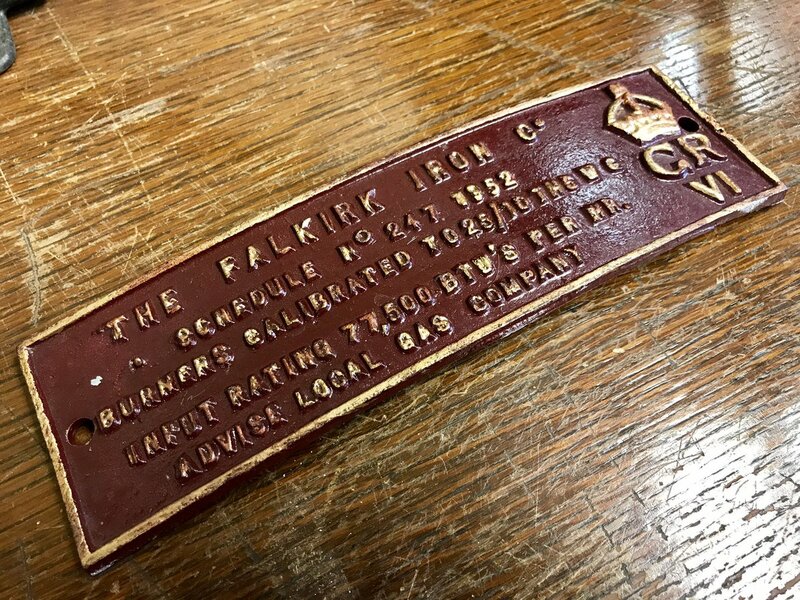 Maker’s plate from a boiler made by the Falkirk Iron Co.
A beautiful hand-drawn poster of an industrial fan made by Howden’s of Glasgow. 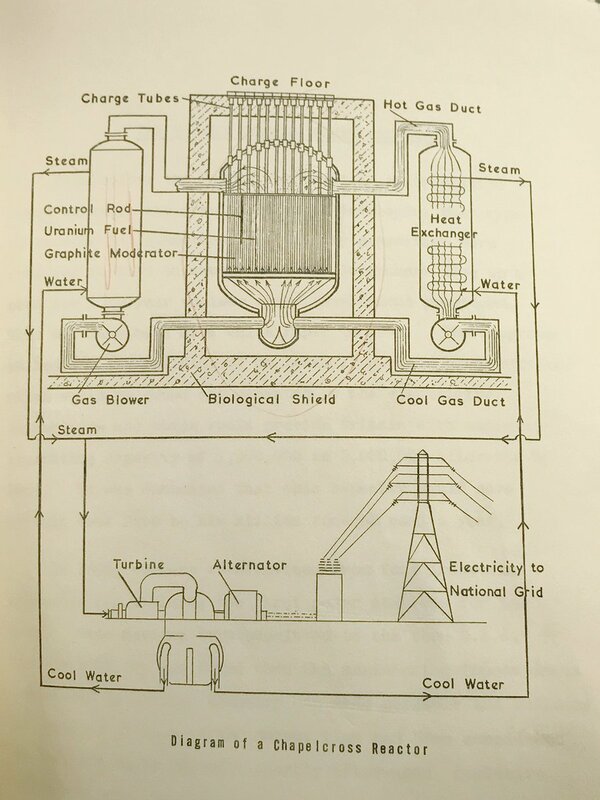 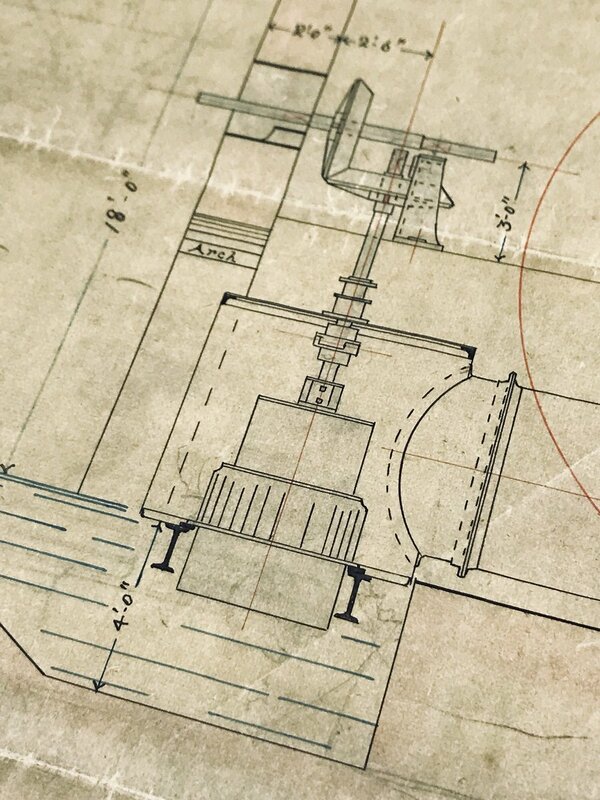 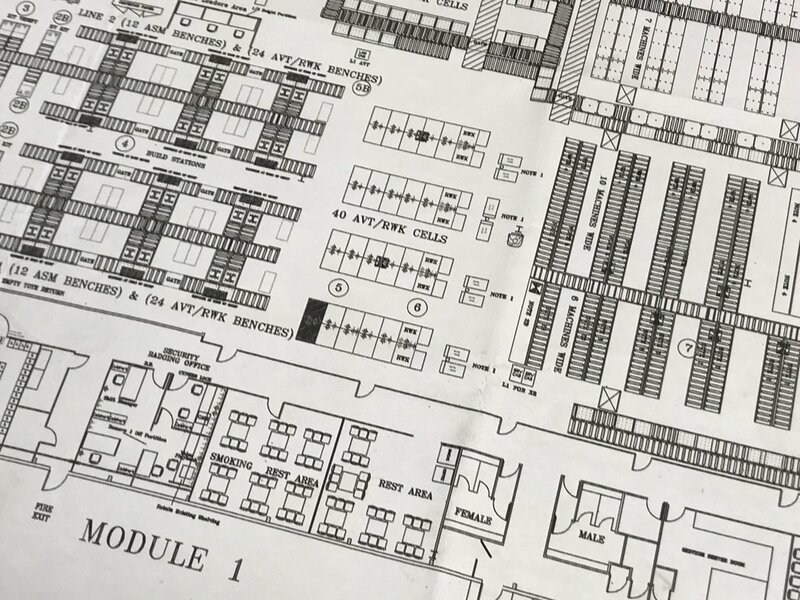 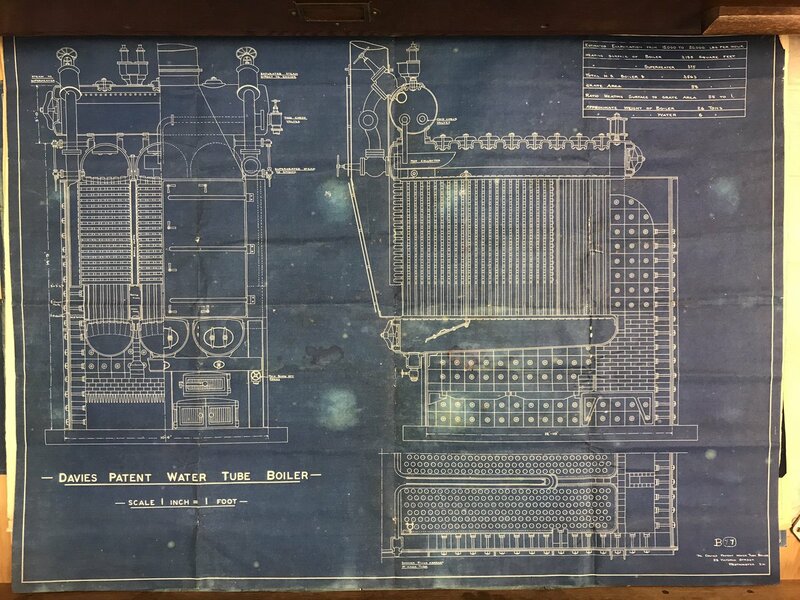 Plan of a Davies Patent Water Tube Boiler. 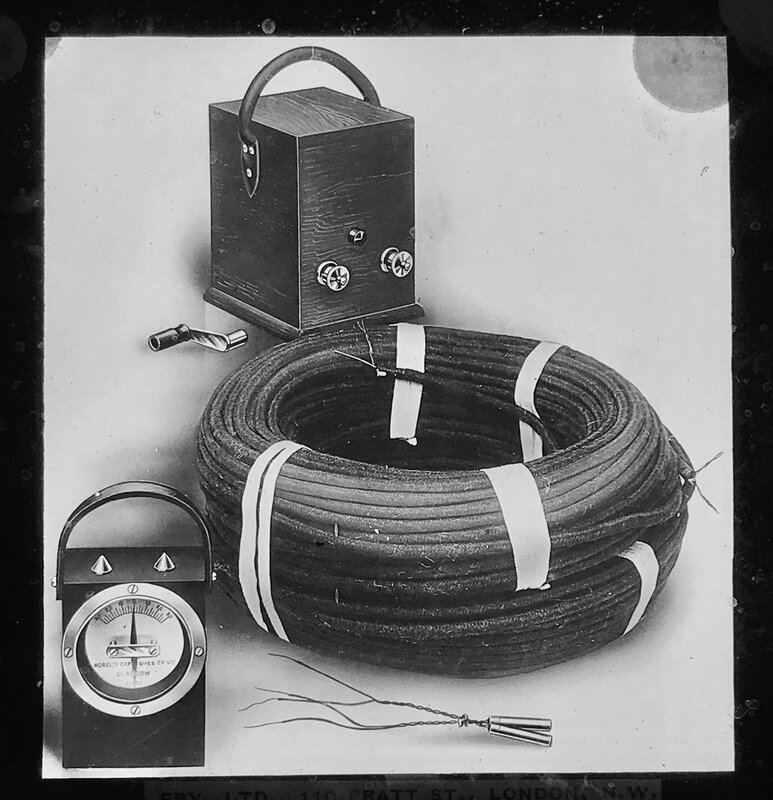 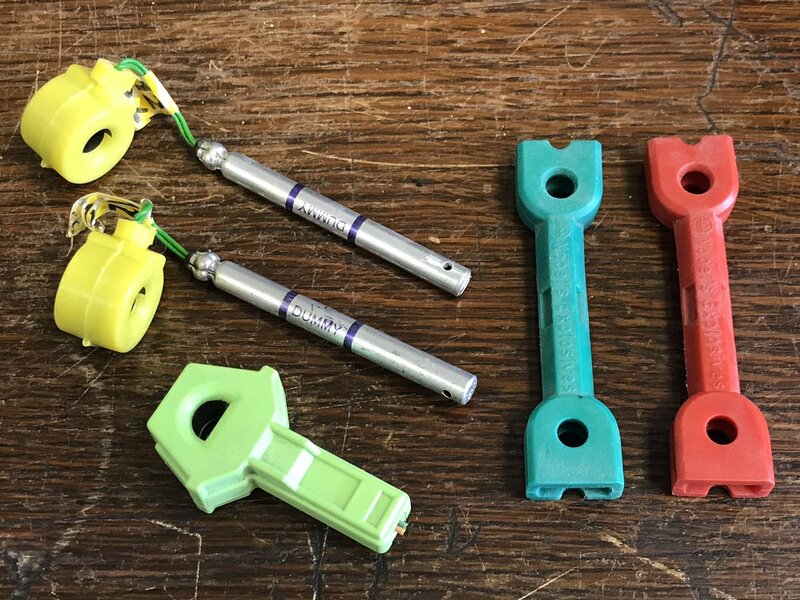 Dummy detonators and connectors from Nobel’s Explosives. 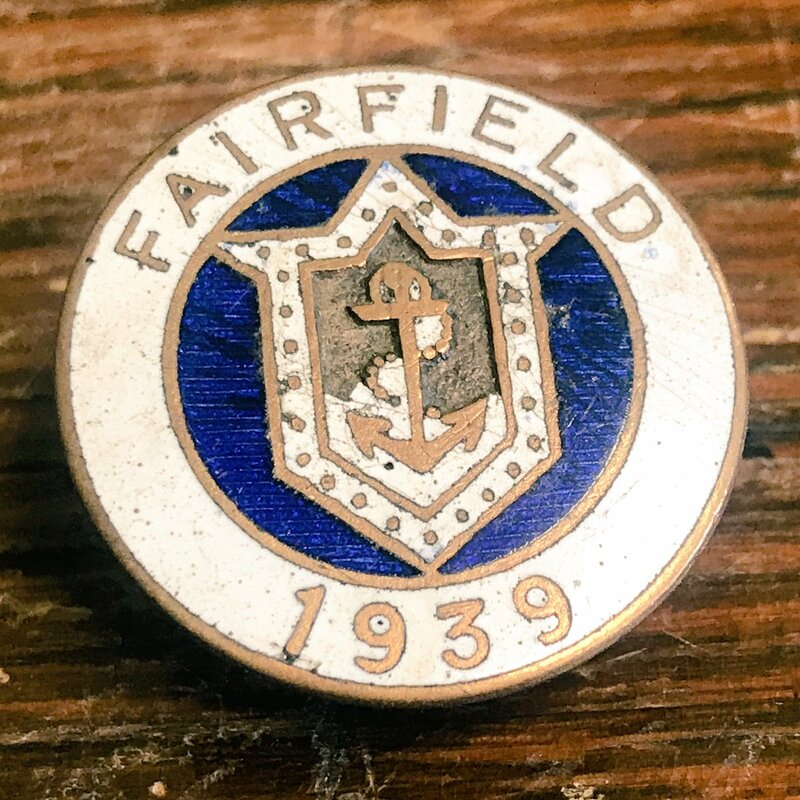 A War Service badge from the Fairfield shipyard – now BAE Systems Govan. 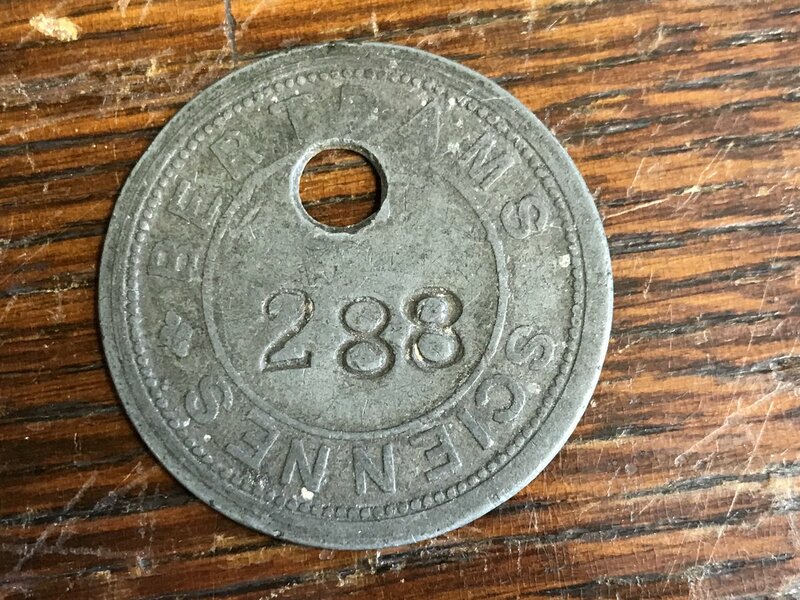 Pay check token from Bertram’s of Sciennes. 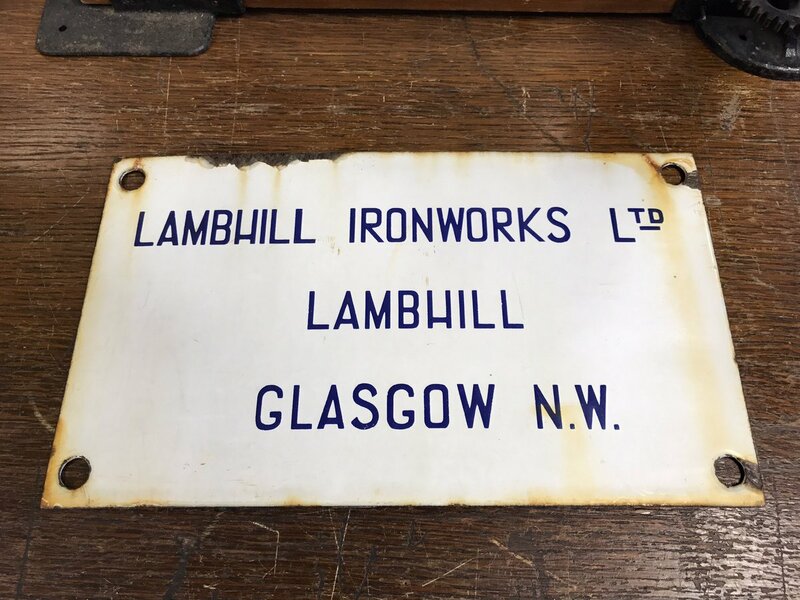 Enamel sign from Lambhill Ironworks. 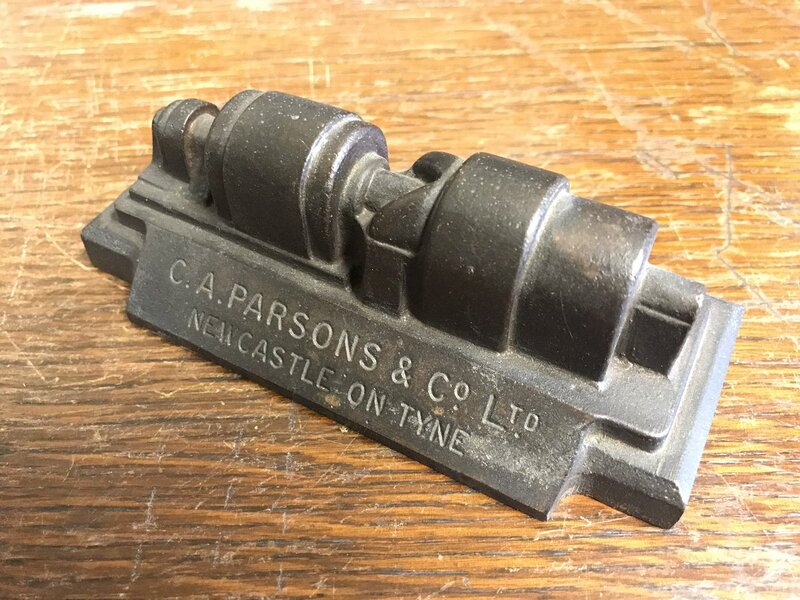 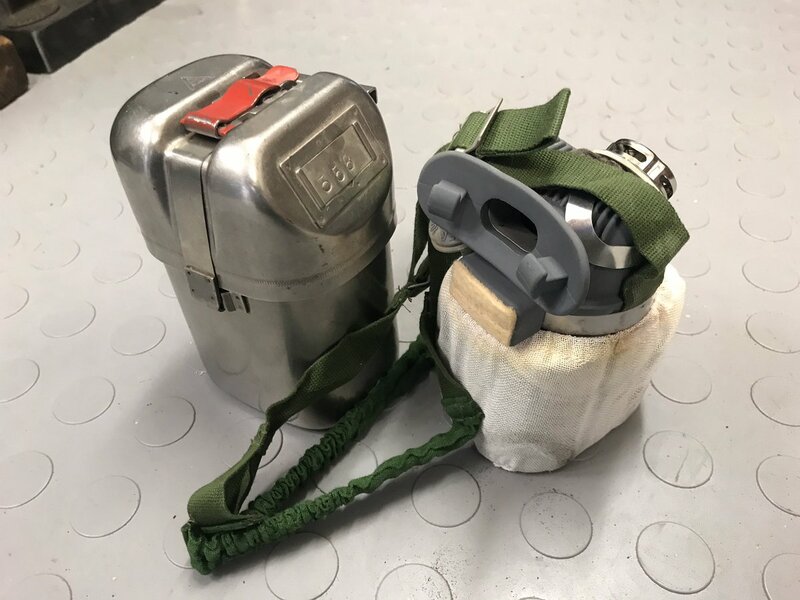 Oil can from the North British Railway. 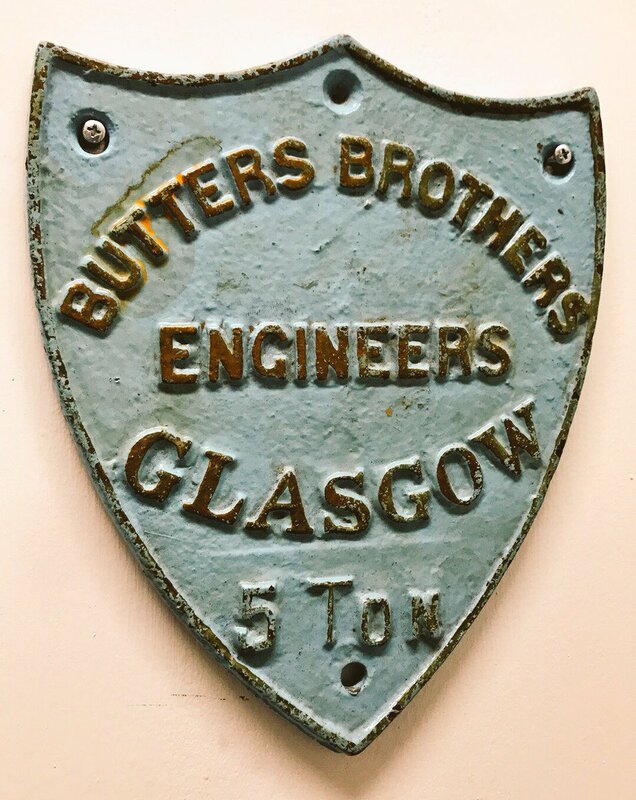 Plate from a 5 Ton Butters Brothers crane. 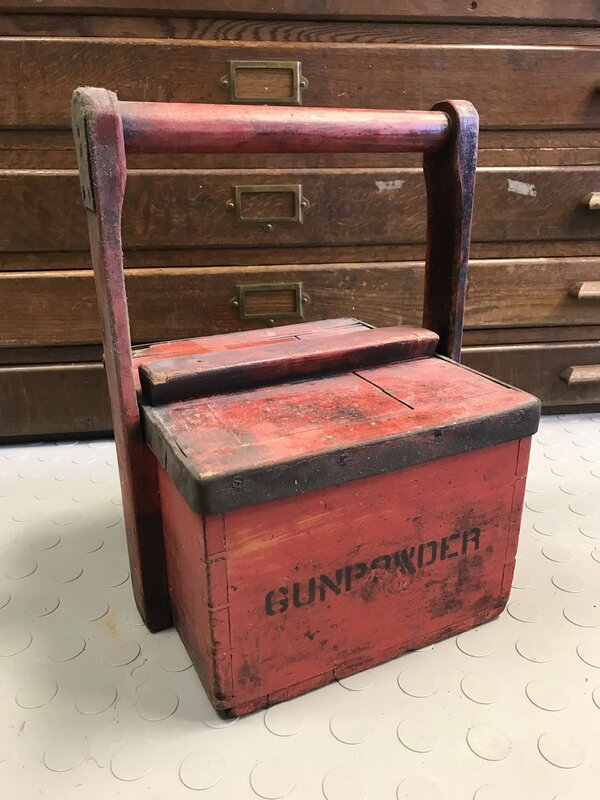 Gunpowder carrying box from Nobel’s Explosives, Ardeer. 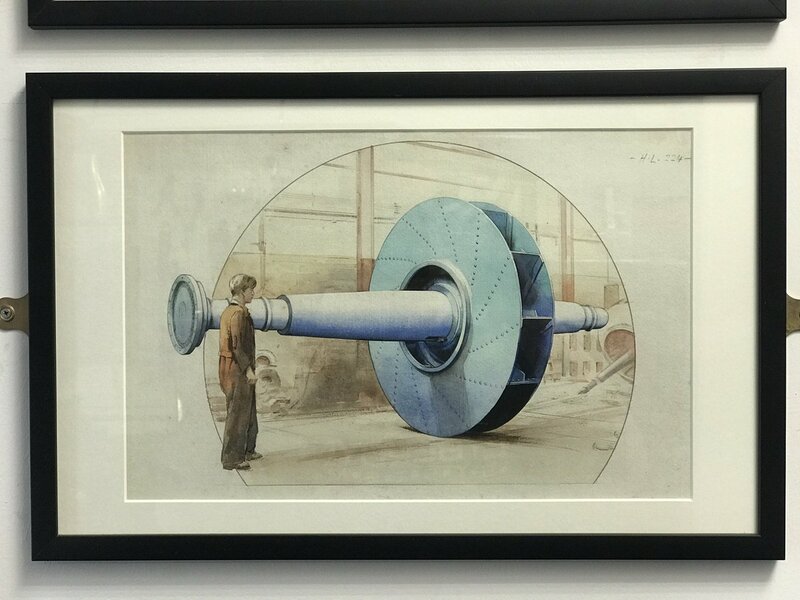 Measuring gauge from Nobel’s Explosives, Ardeer. 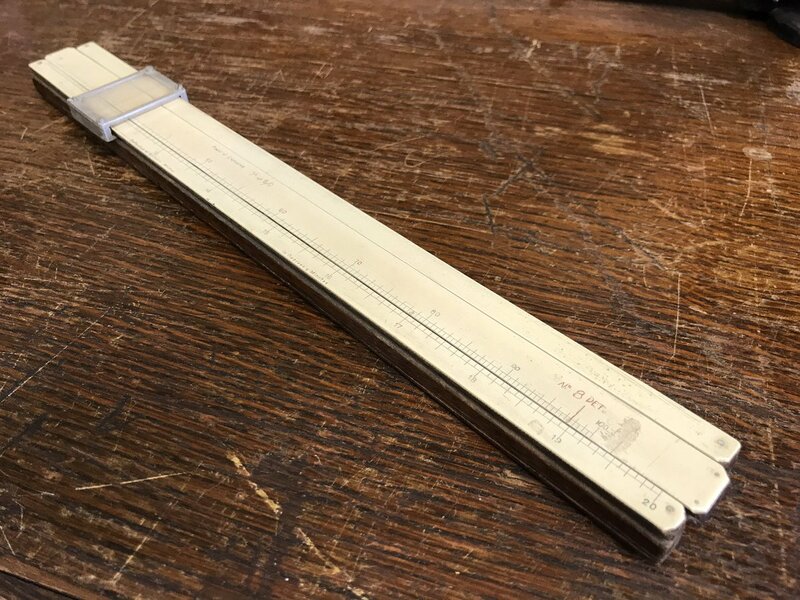 Not sure what this would’ve measured. 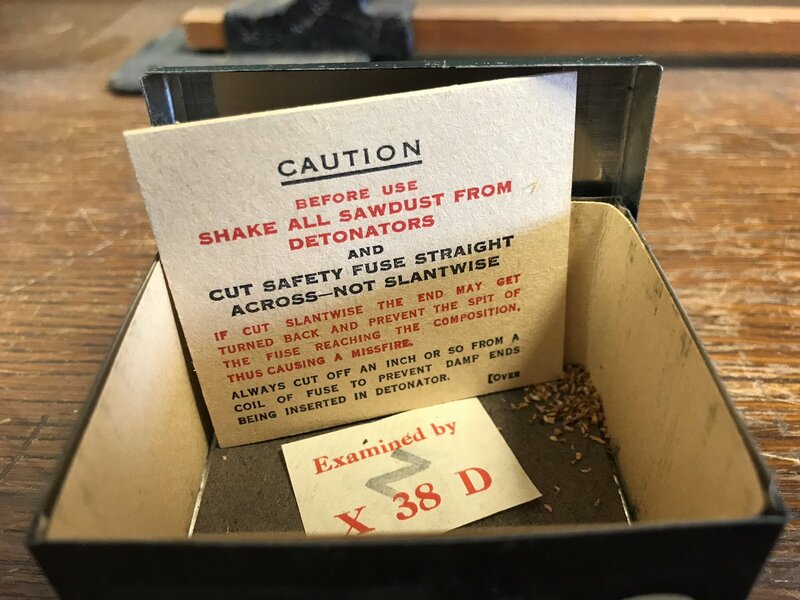 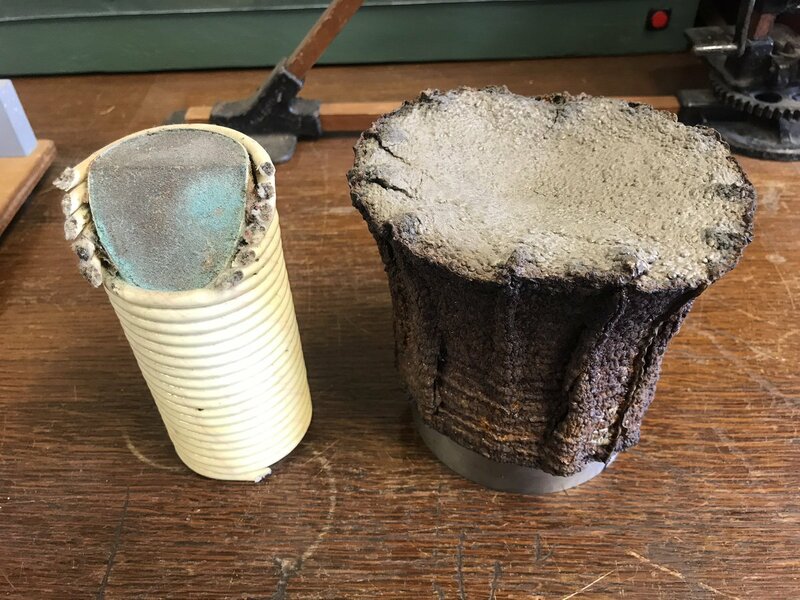 Demonstration of explosive sintering, from Nobel’s Explosive Works, Ardeer. 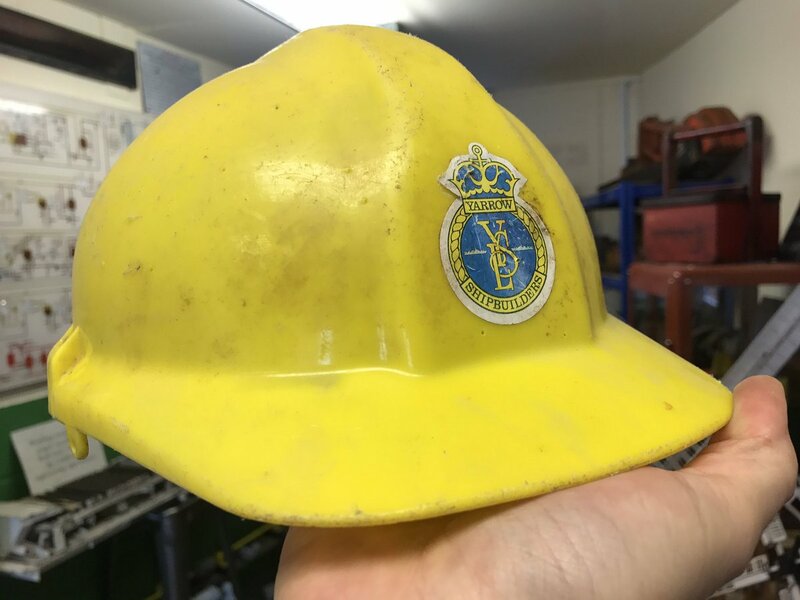 Hard hat from Yarrow Shipbuilders, now part of BAE Systems. 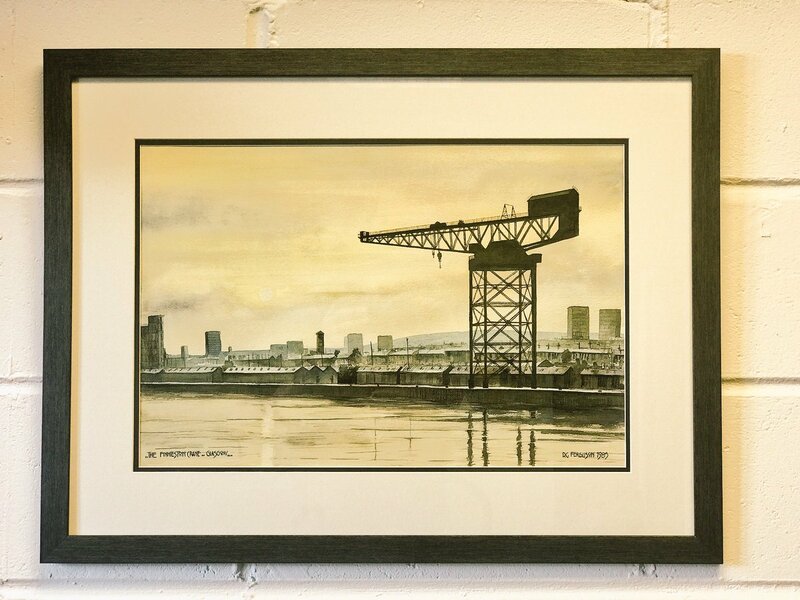 A Magnadet Exploder from Nobel’s Explosives Co. Ltd.
Painting of The Finnieston Crane by DC Ferguson, 1985. 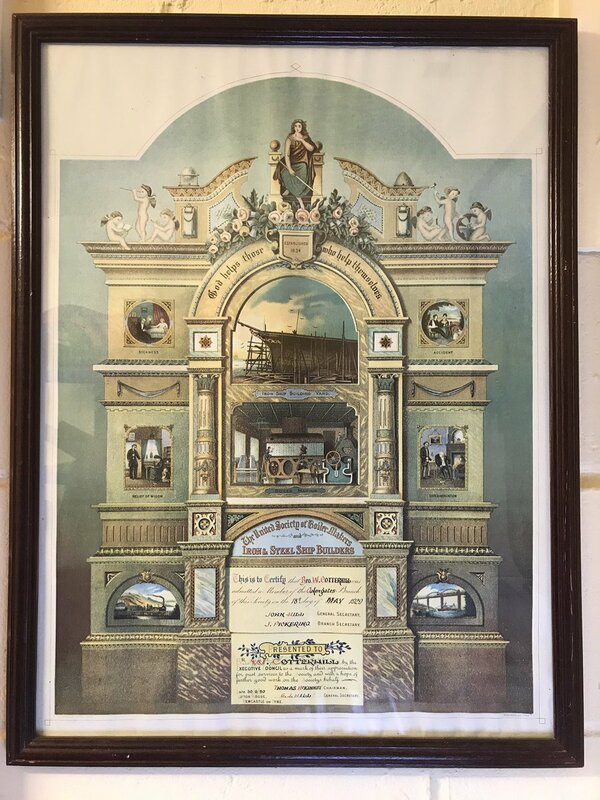 Certificate from The United Society of Boiler Makers and Iron & Steel Ship Builders. 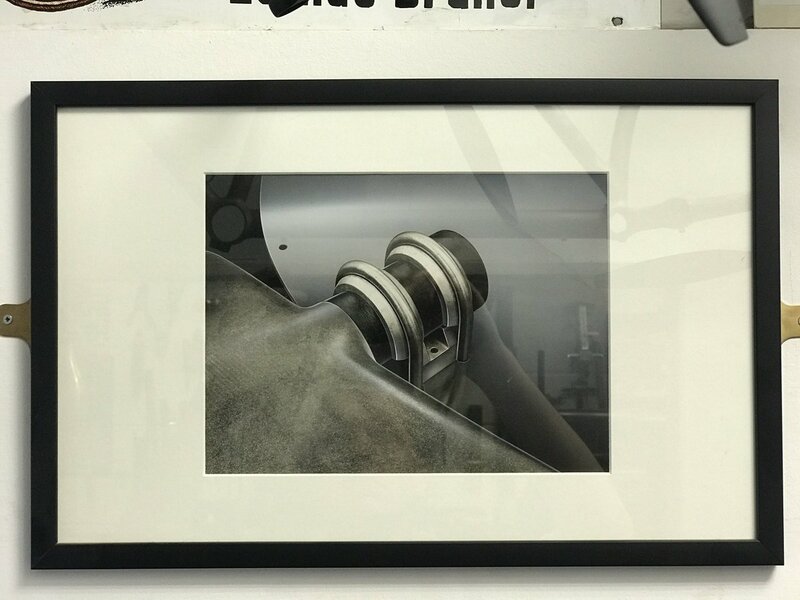 High speed explosion photos from Nobel’s Explosives, taken with a rotating mirror camera. 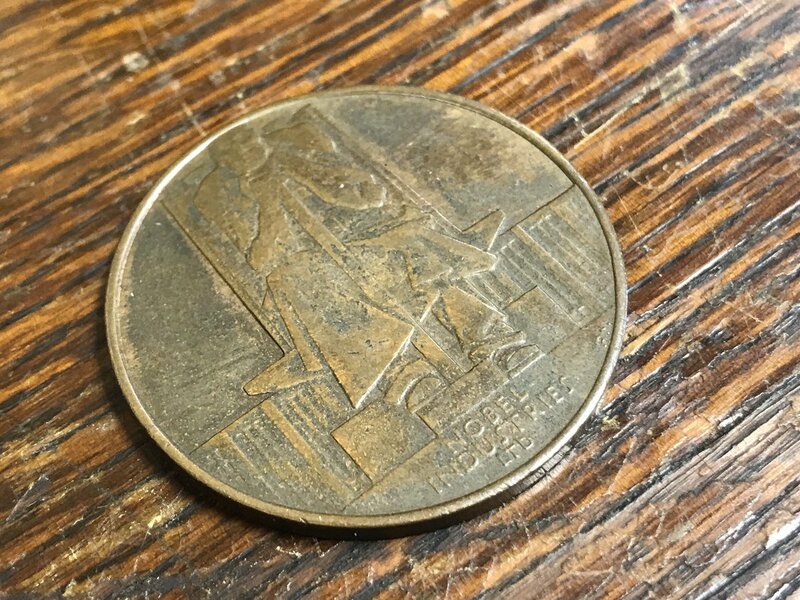 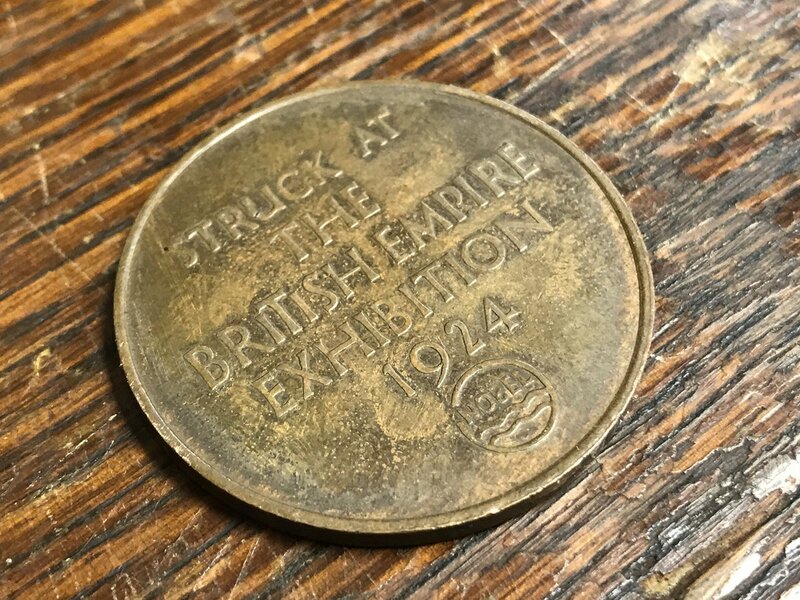 Medal struck by Nobel’s Industries to commemorate the 1924 British Empire Exhibition. 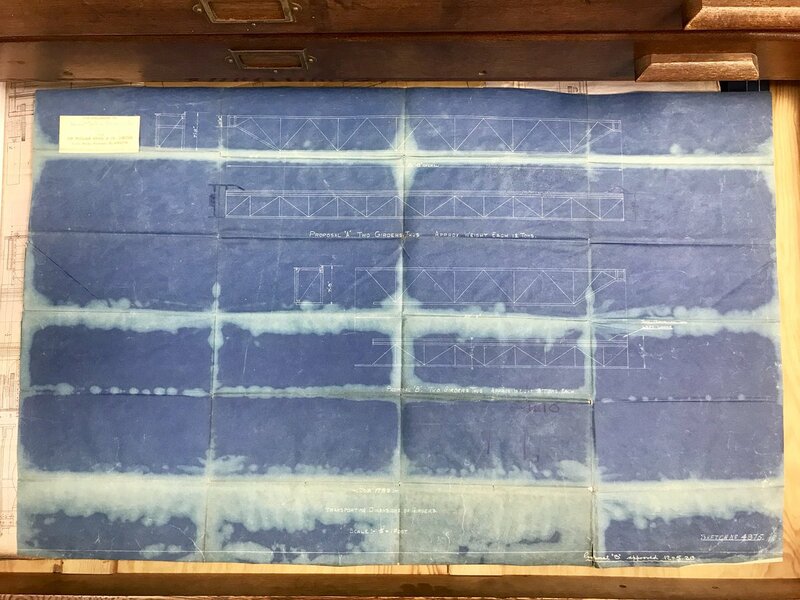 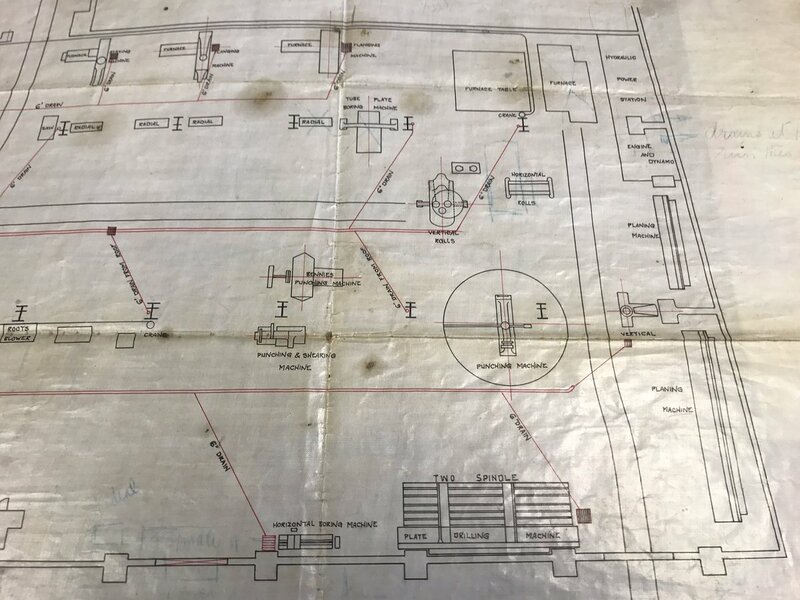 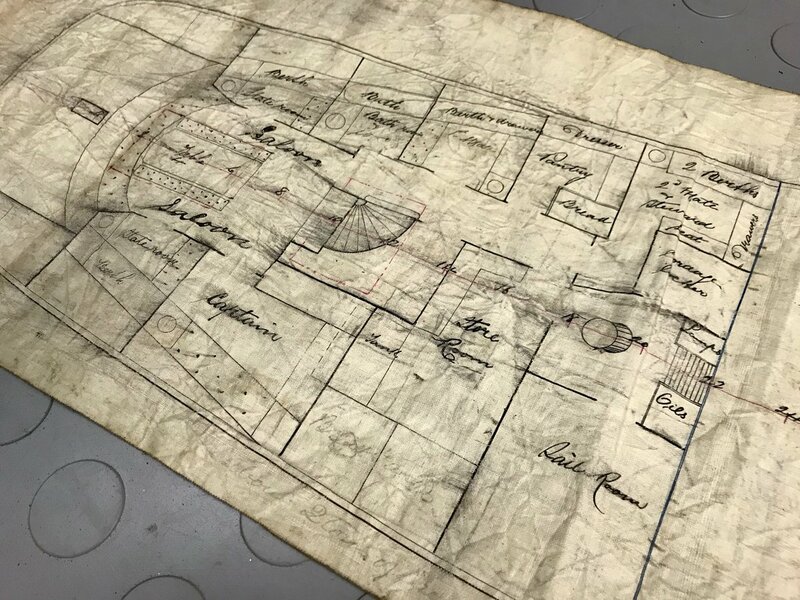 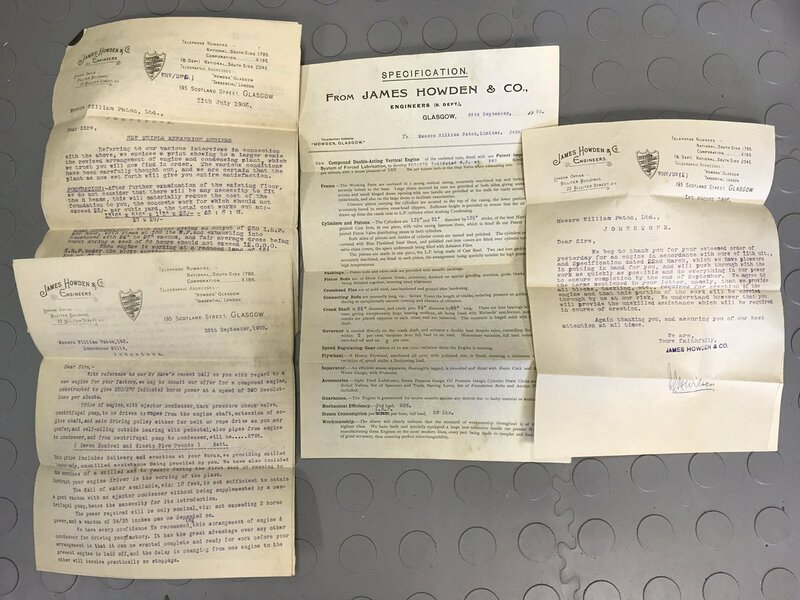 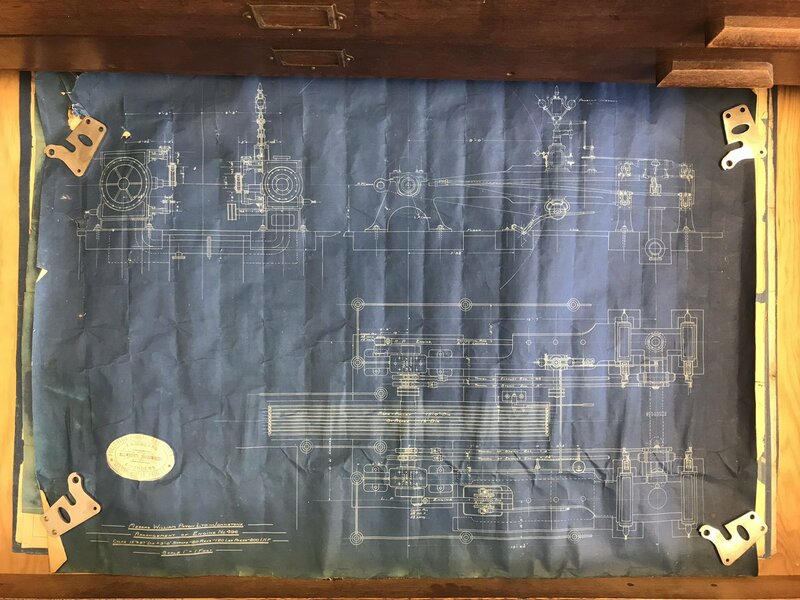 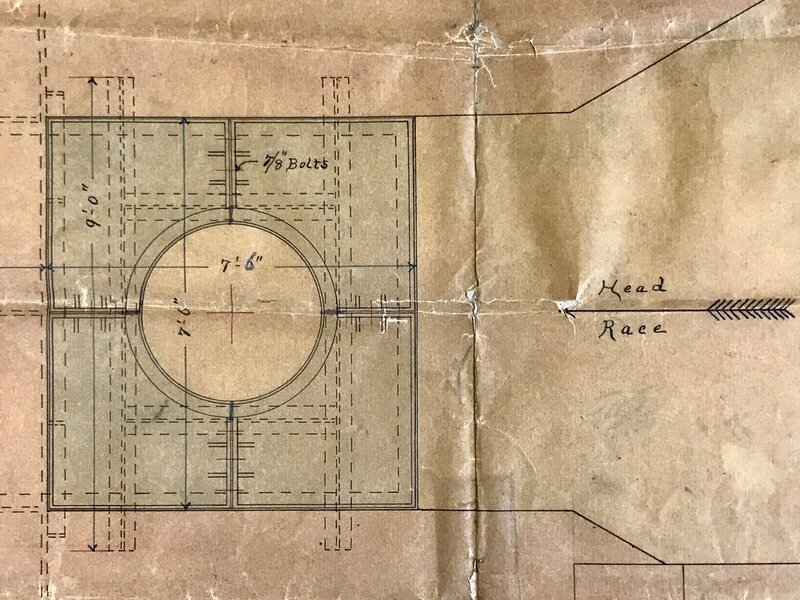 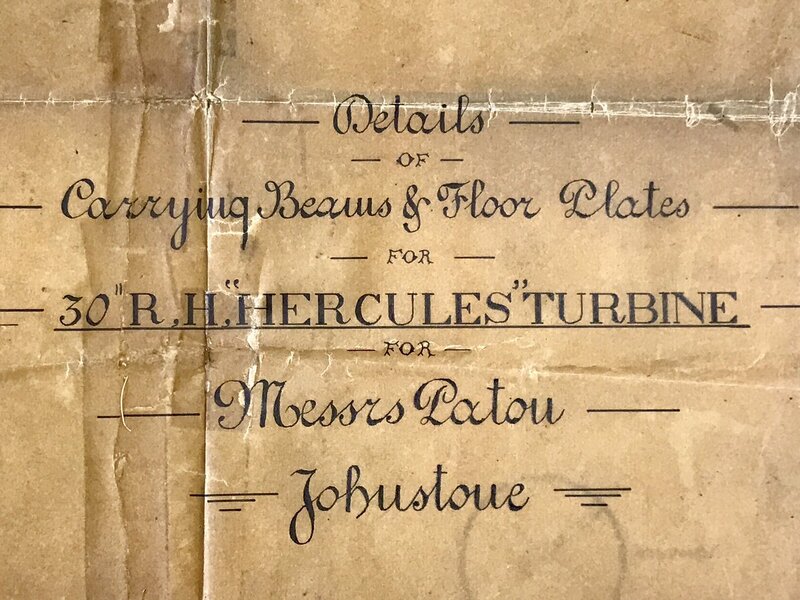 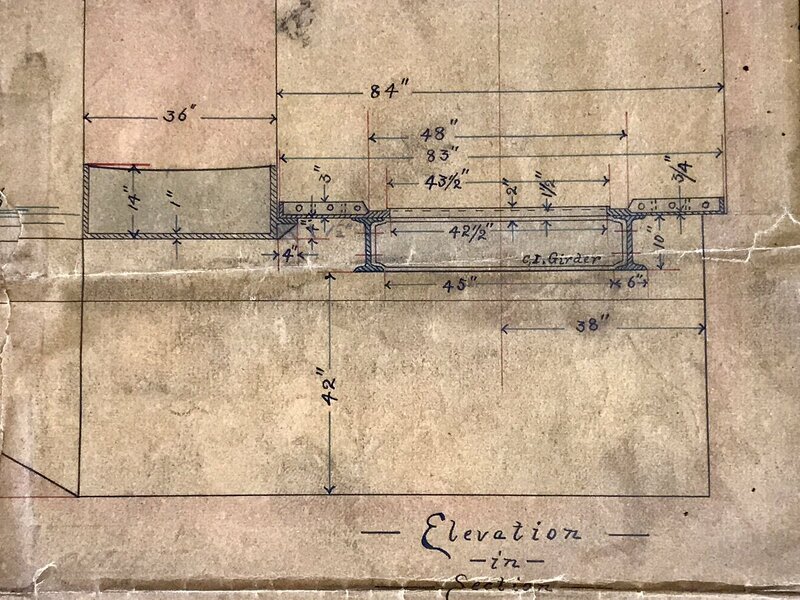 Steam engine blueprint, Fullerton, Hodgart & Barclay of Paisley, for Paton’s of Johnstone. 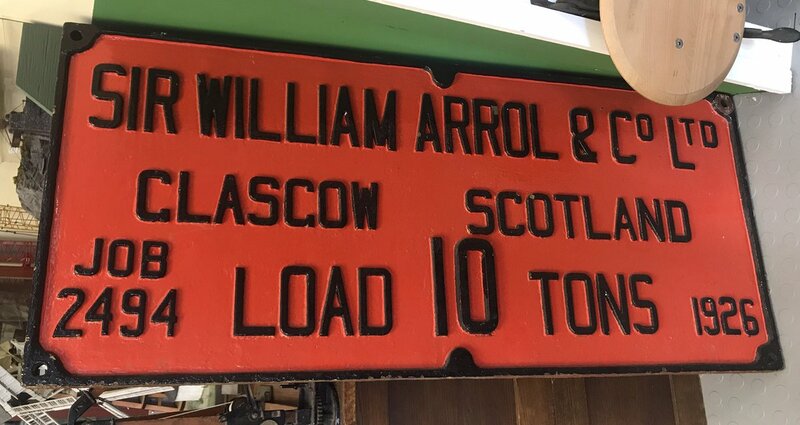 Plates from Drysdale pumps. 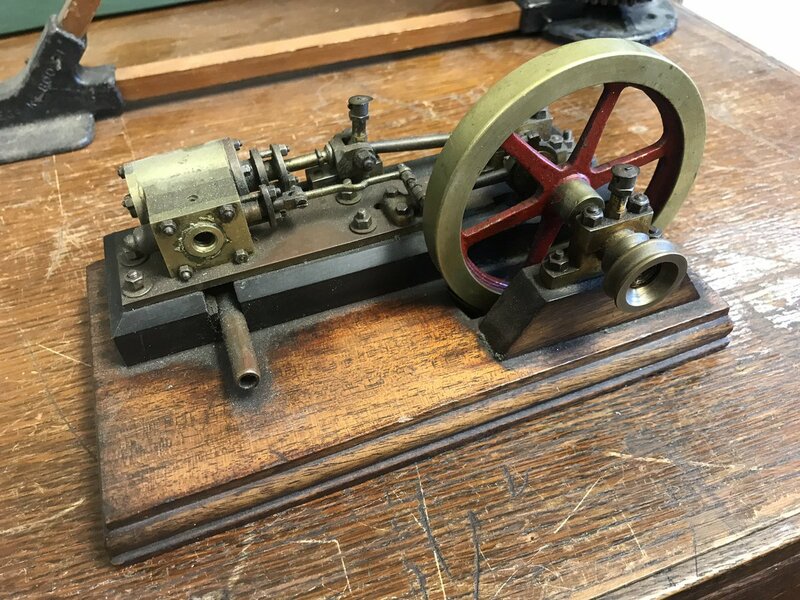 Founded in 1874, Drysdale & Co made pumps and other engines. 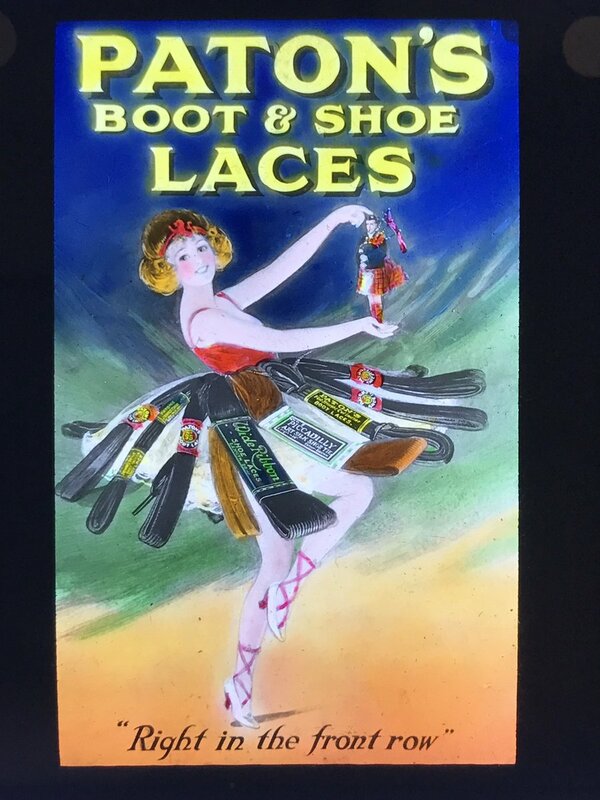 Magazine cover from 7th May 1938. 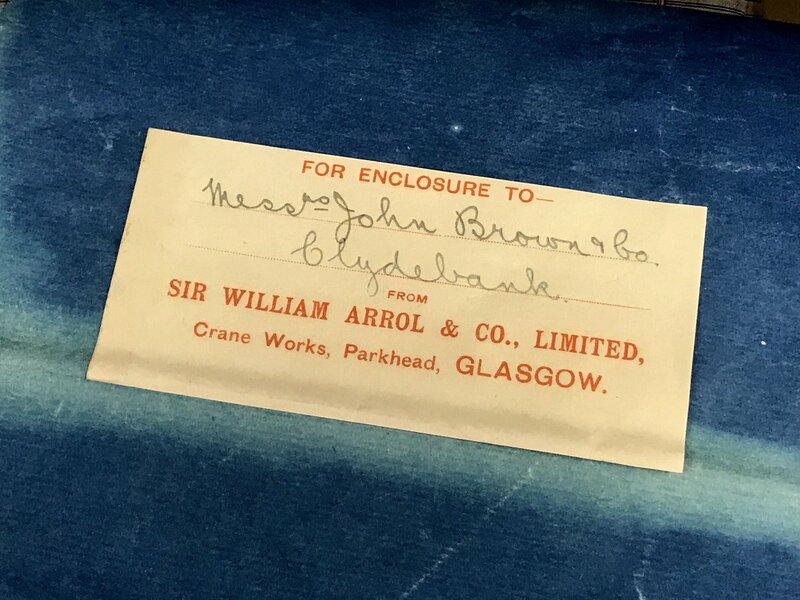 A large and very, very heavy plate from a crane made by Sir William Arrol & Co Ltd.
Sterling machine for bevelling the corners of books, made in Portland, Maine. 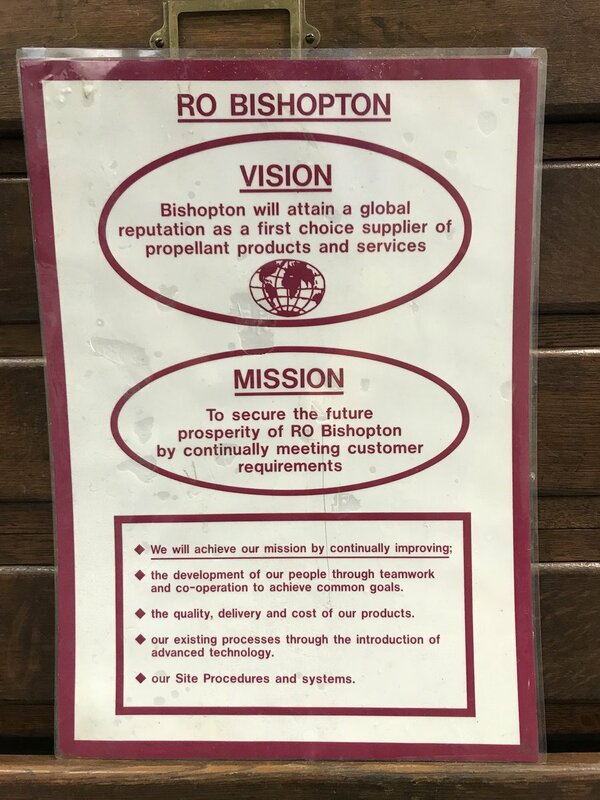 Poster from Royal Ordnance Factory Bishopton. 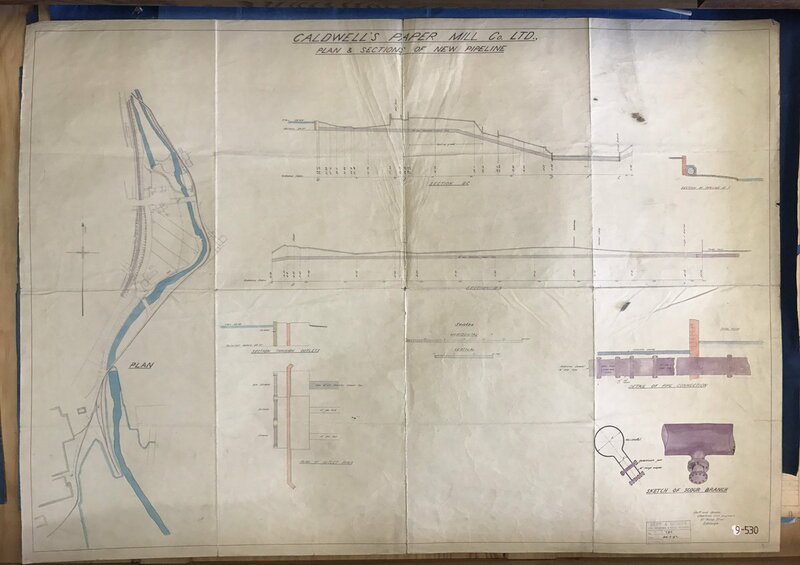 Plan of the Guardbridge Paper Mill, Fife.